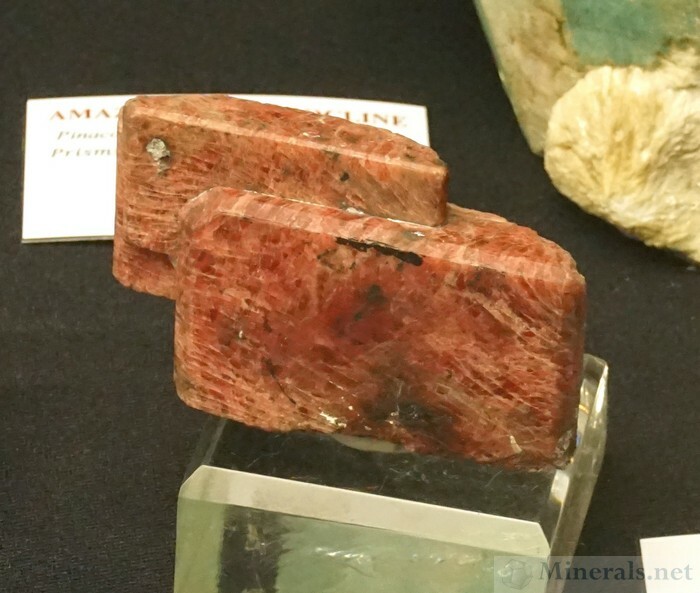 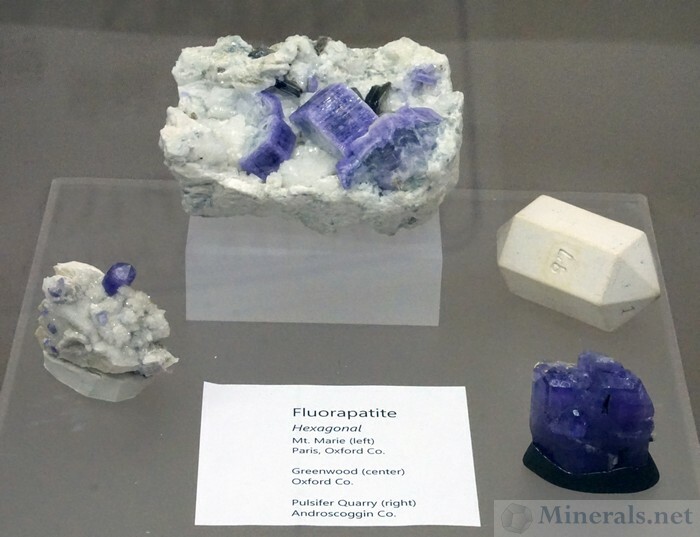 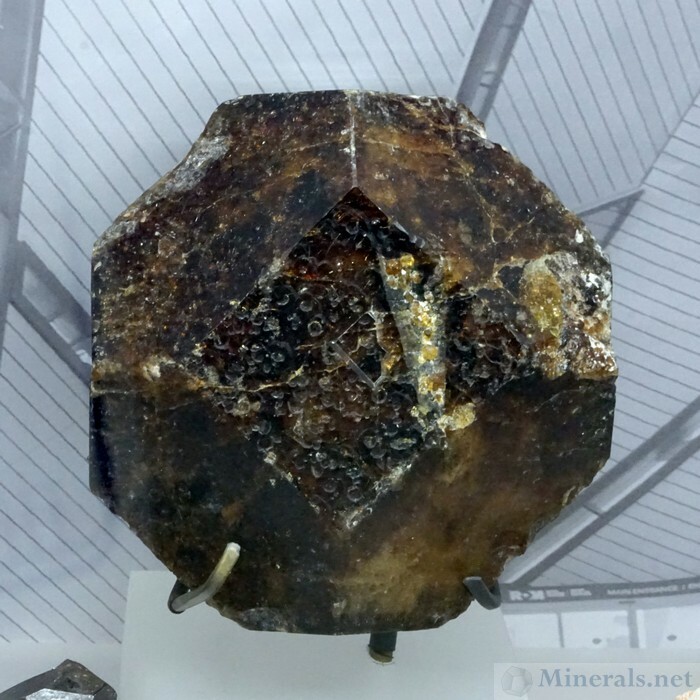 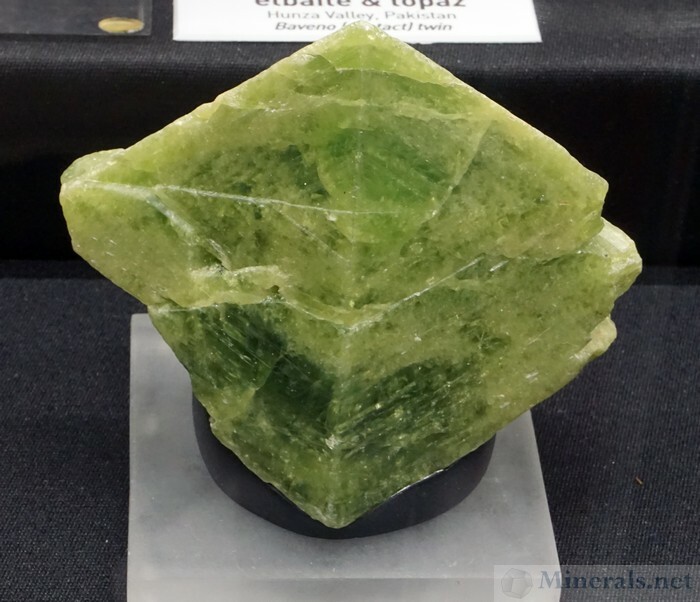 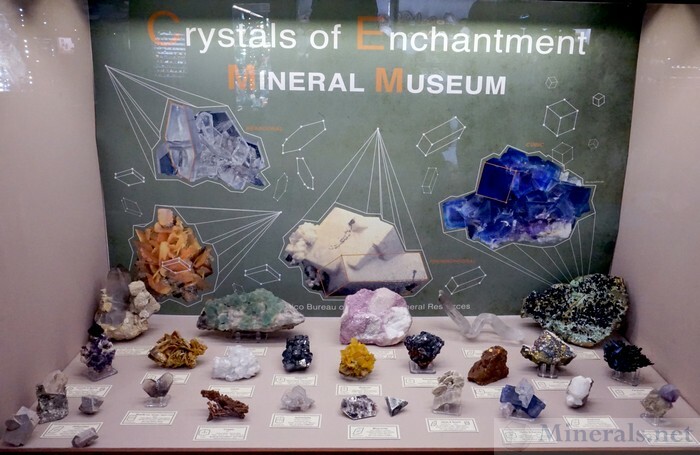 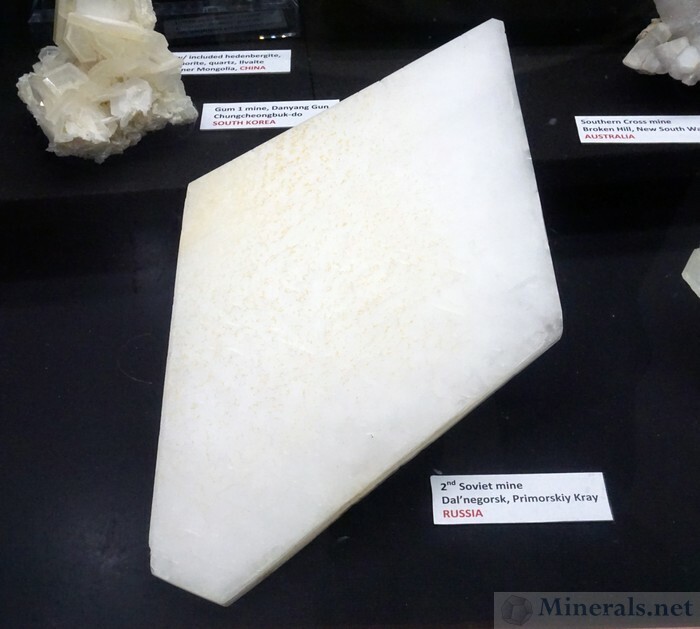 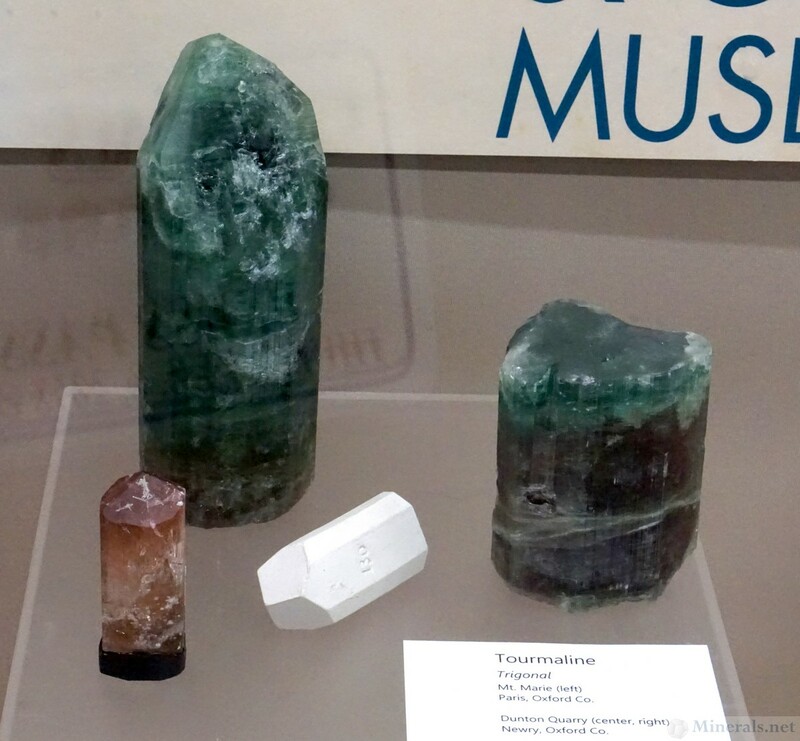 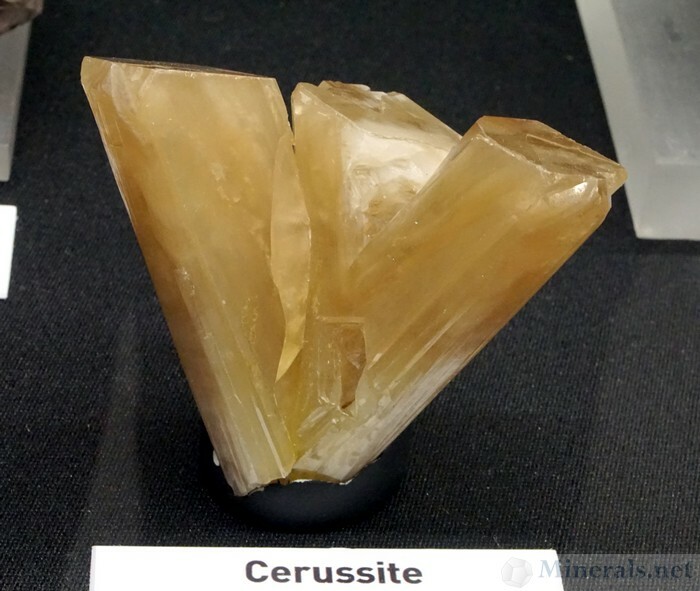 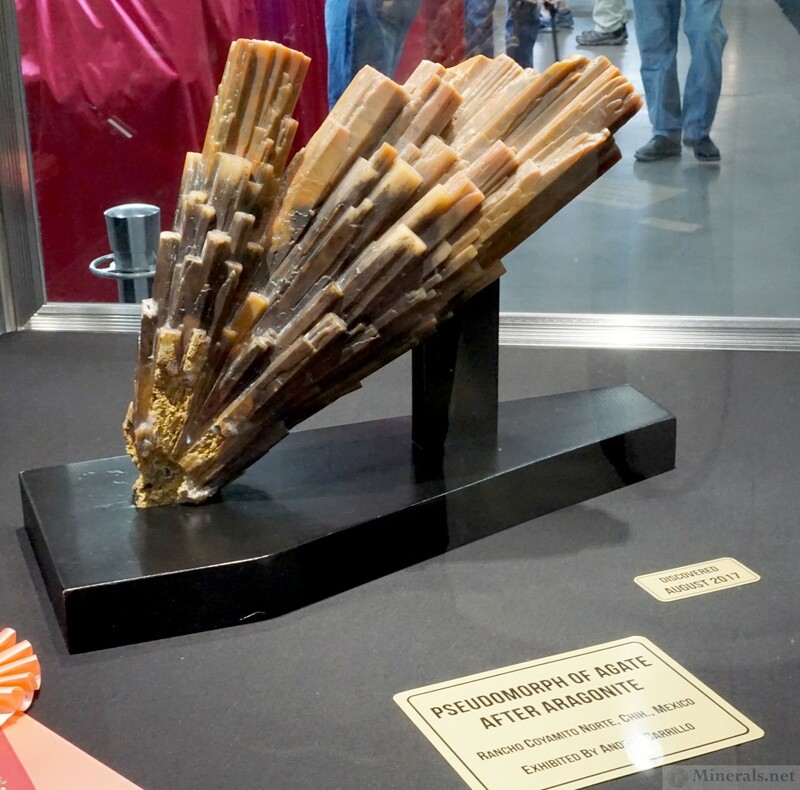 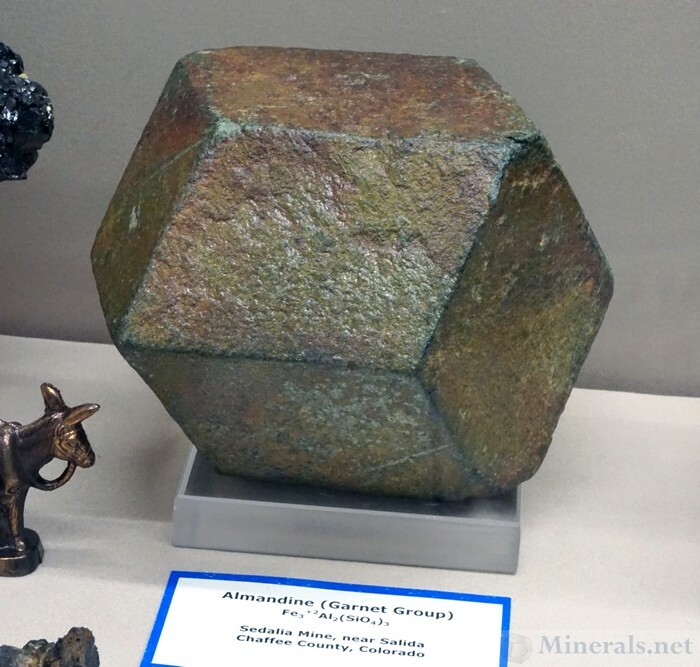 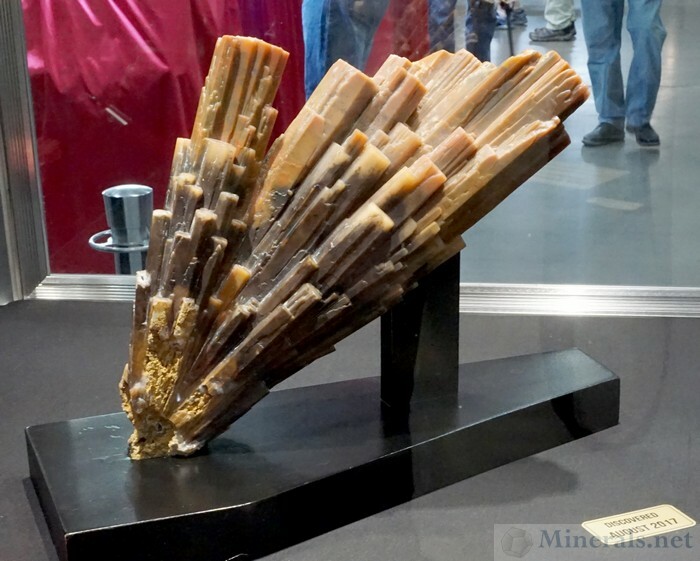 This post shows our selection of some of the interesting or aesthetic minerals in the exhibits of the museum display cases at the 2018 Tucson Gem and Mineral Show®. The theme of the show was "Crystals and Crystal Habits," and many of these minerals have interesting or unique crystal habits in line with this year's show theme. 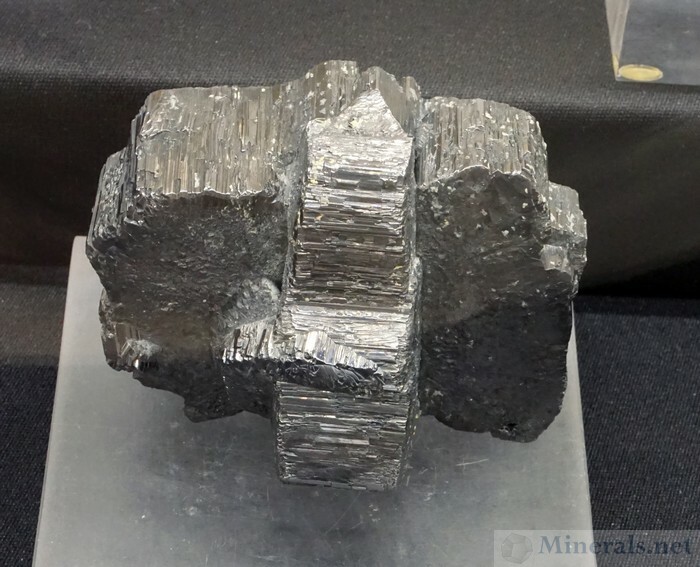 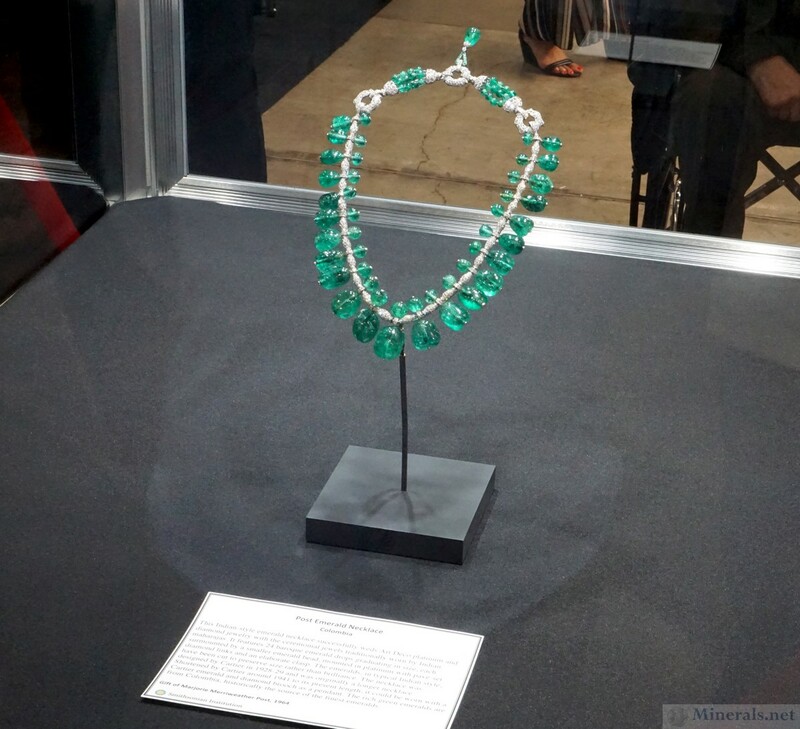 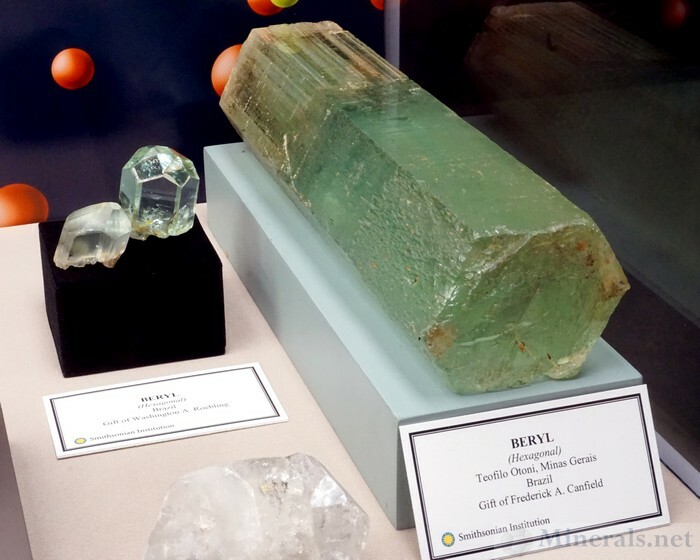 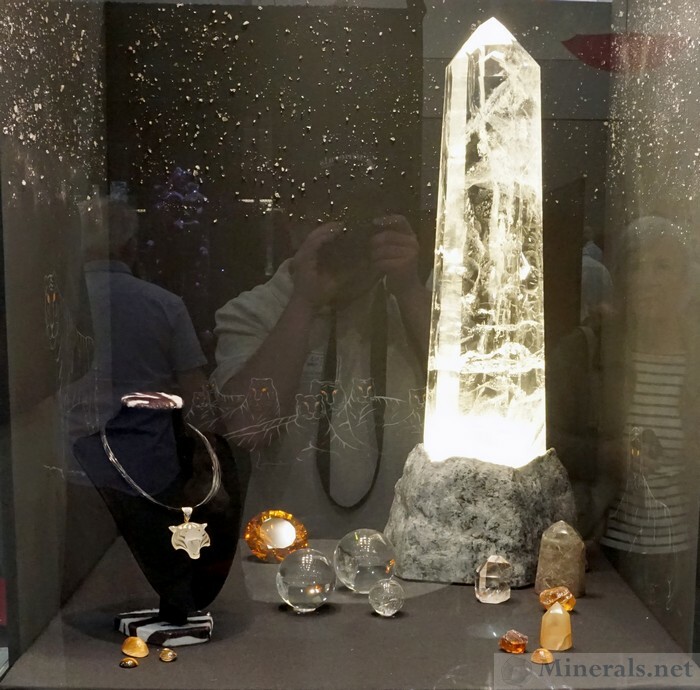 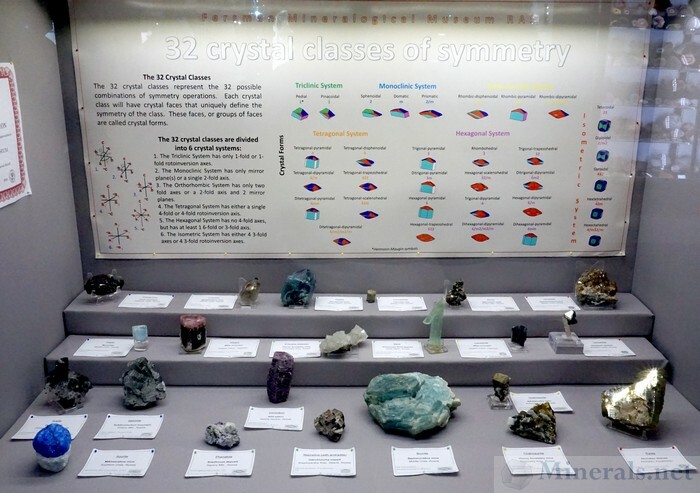 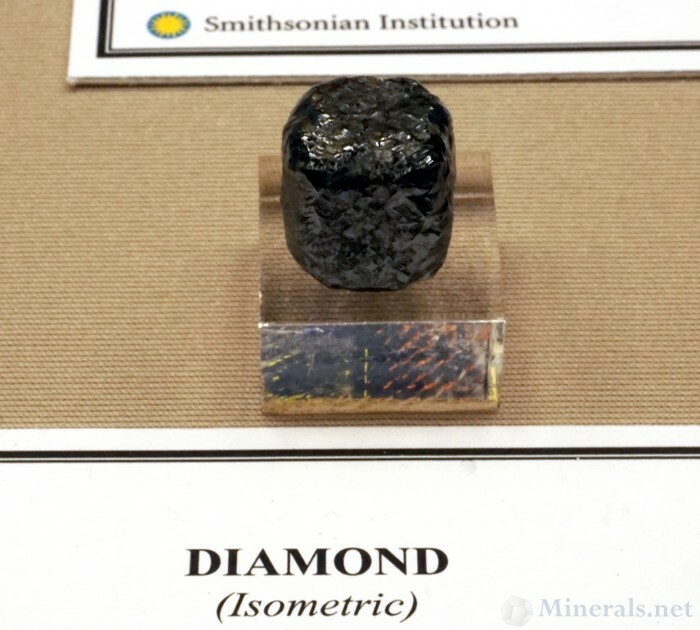 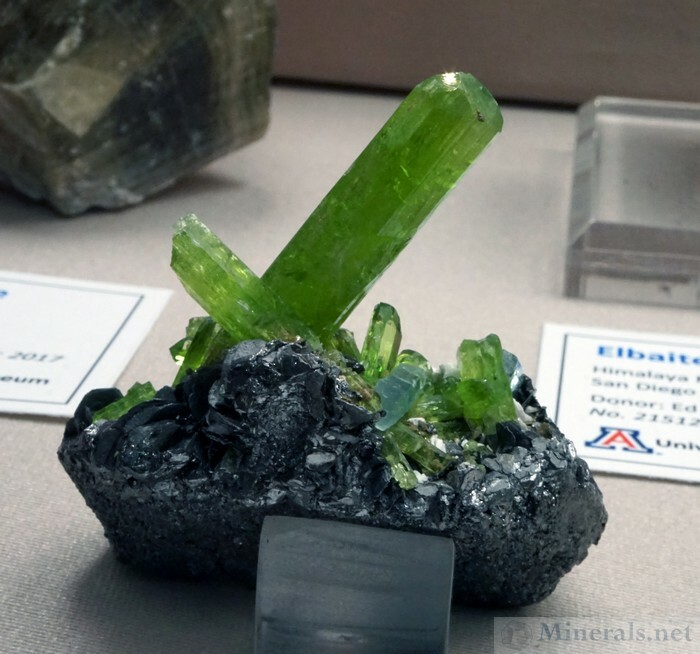 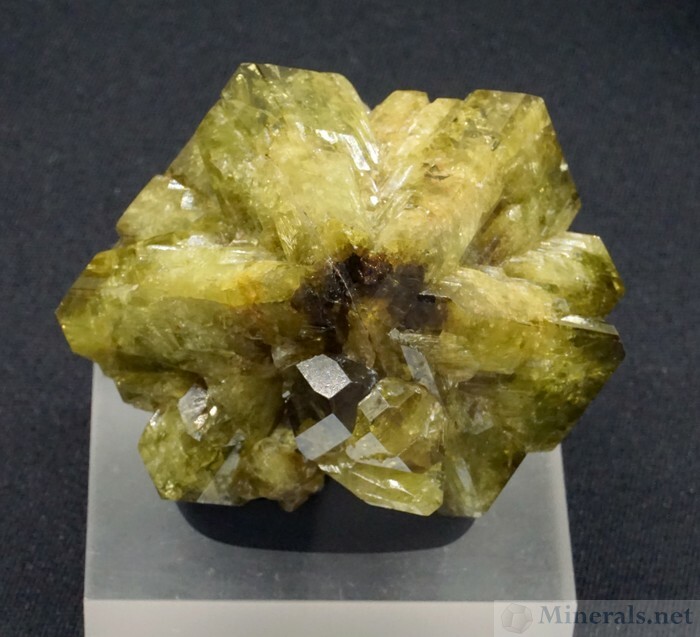 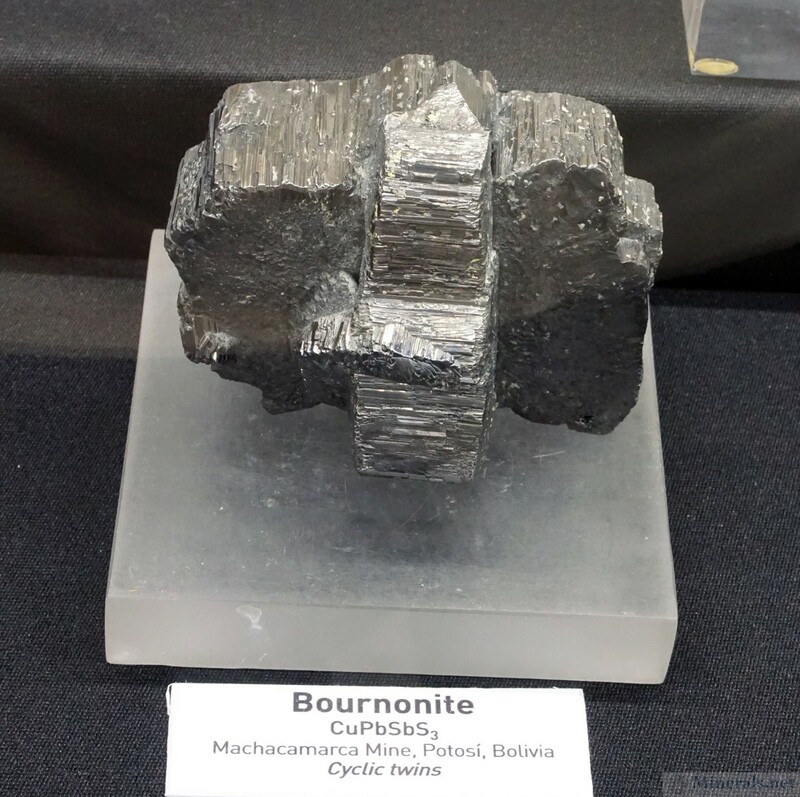 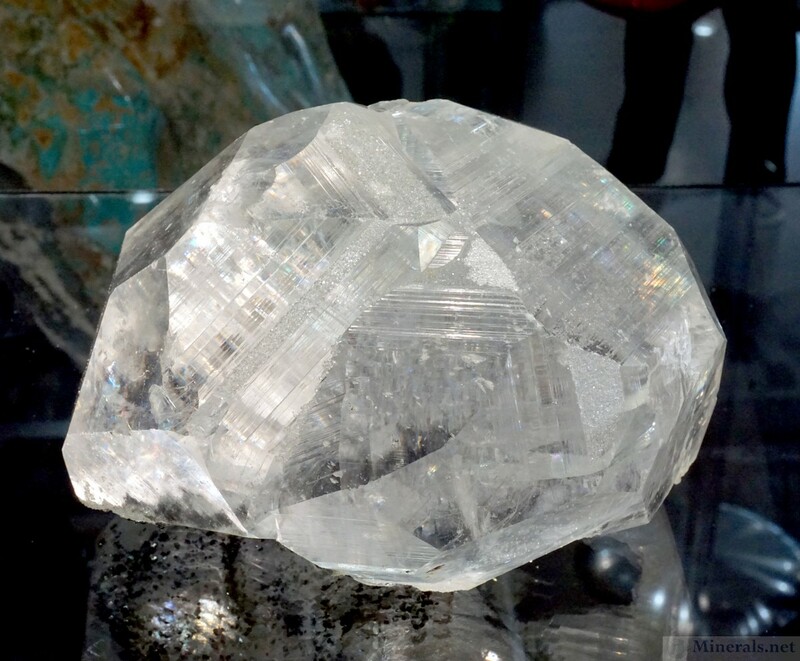 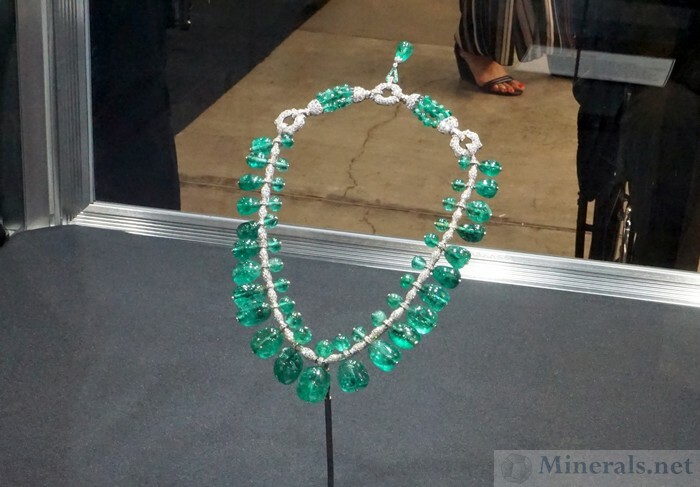 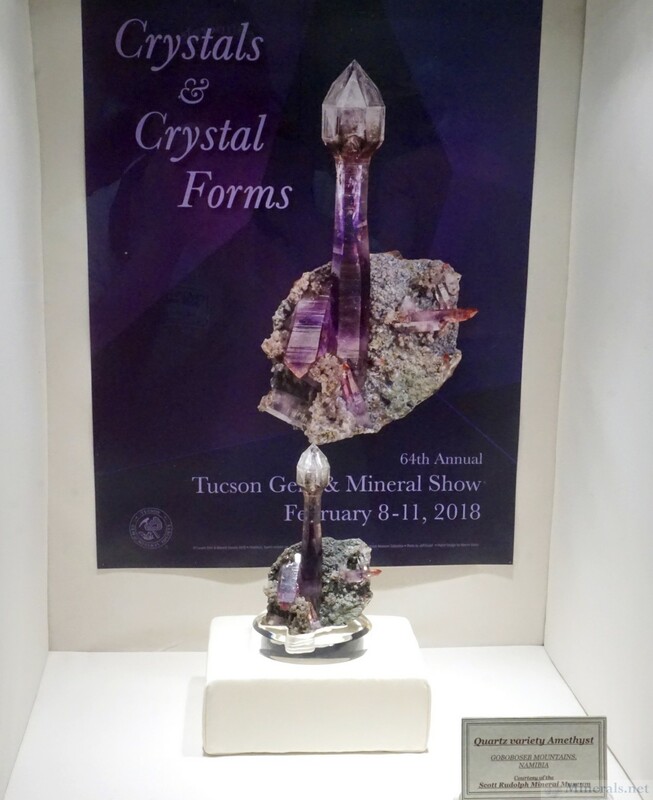 This post is a continuation of the previous post, showing additional museum display exhibits from the 2018 Tucson Gem and Mineral Show. 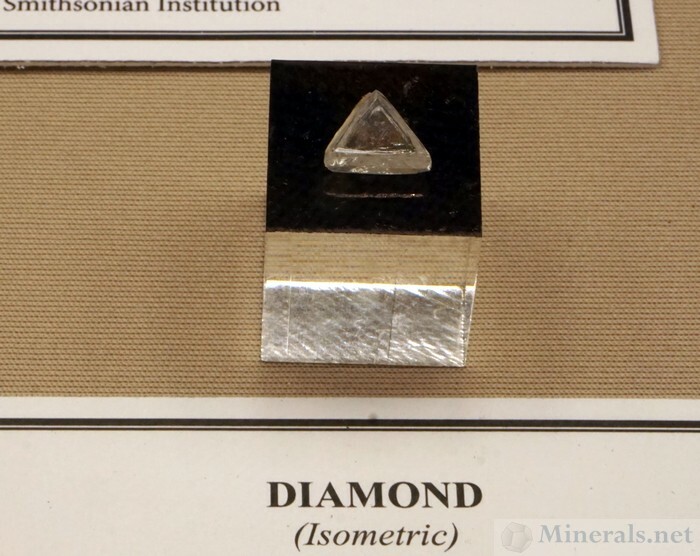 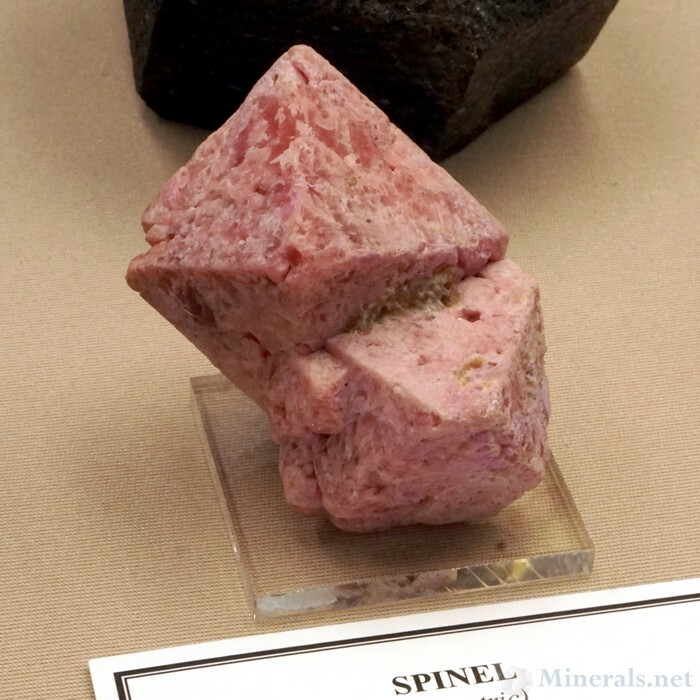 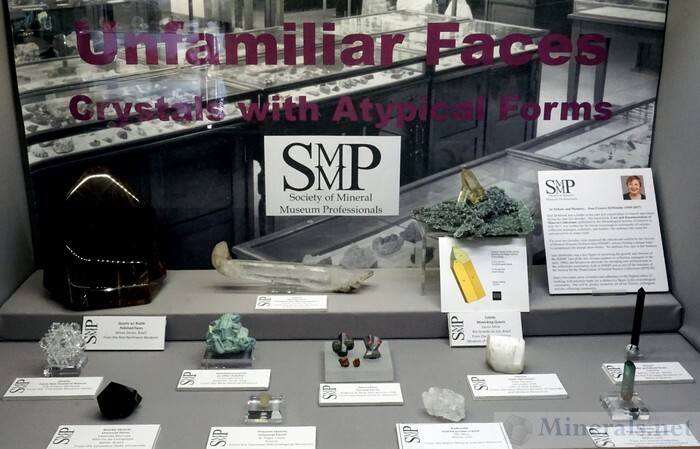 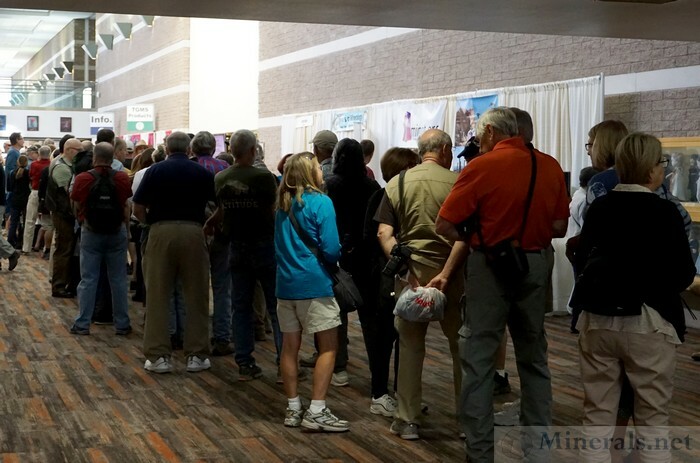 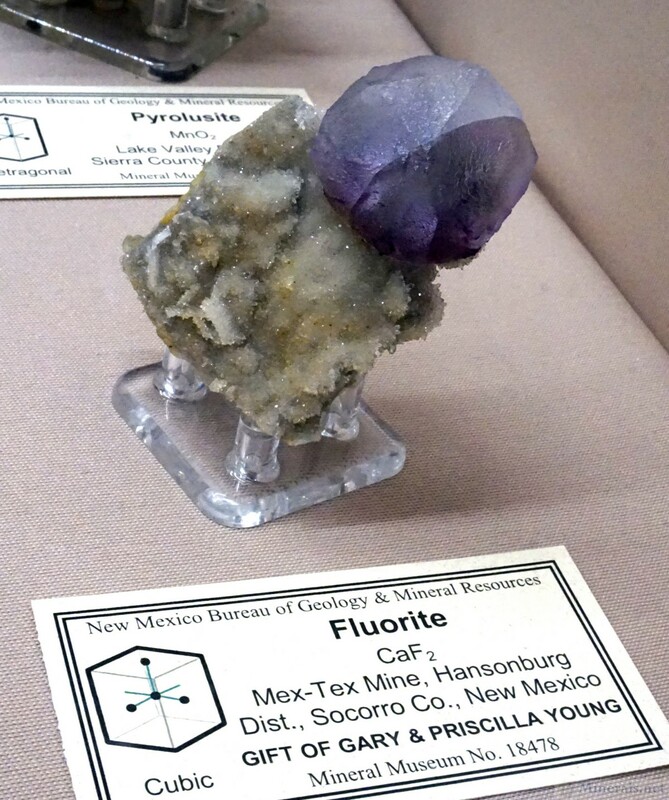 Many important museums exhibit at the The Tucson Gem and Mineral Show®. 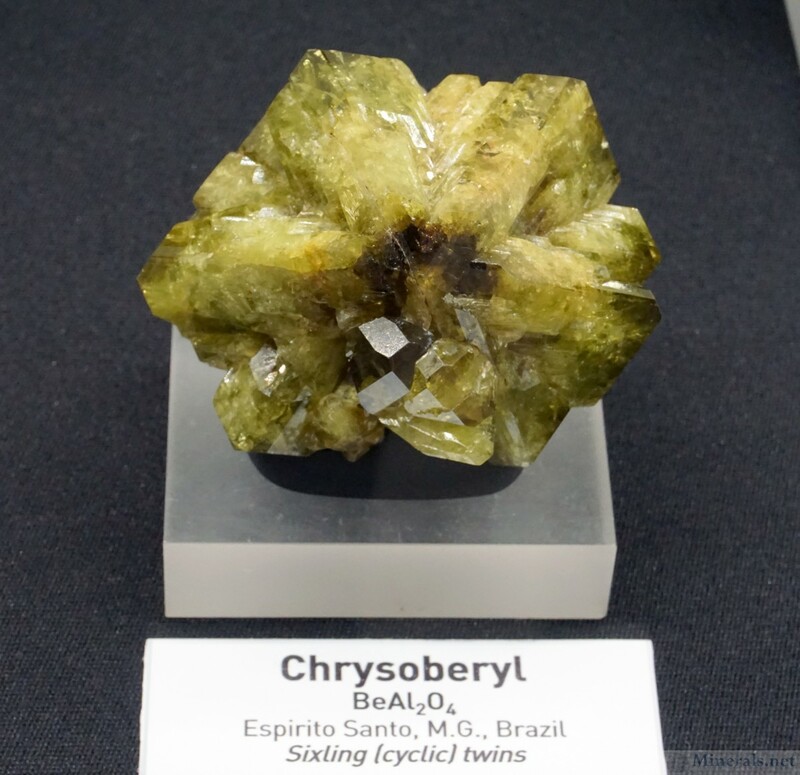 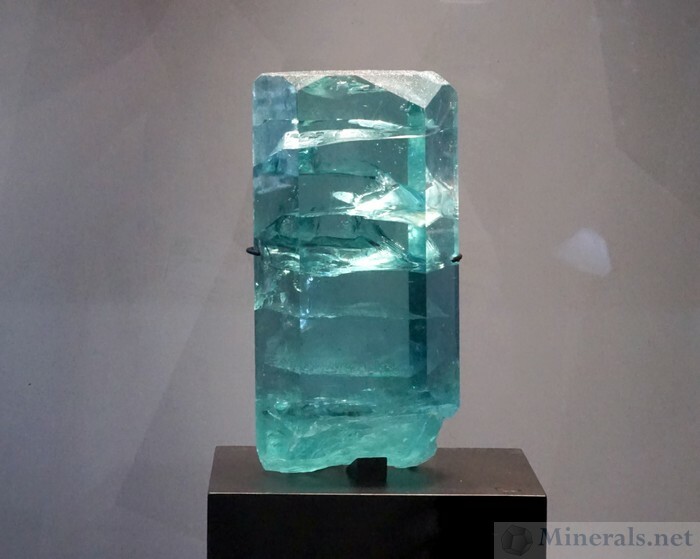 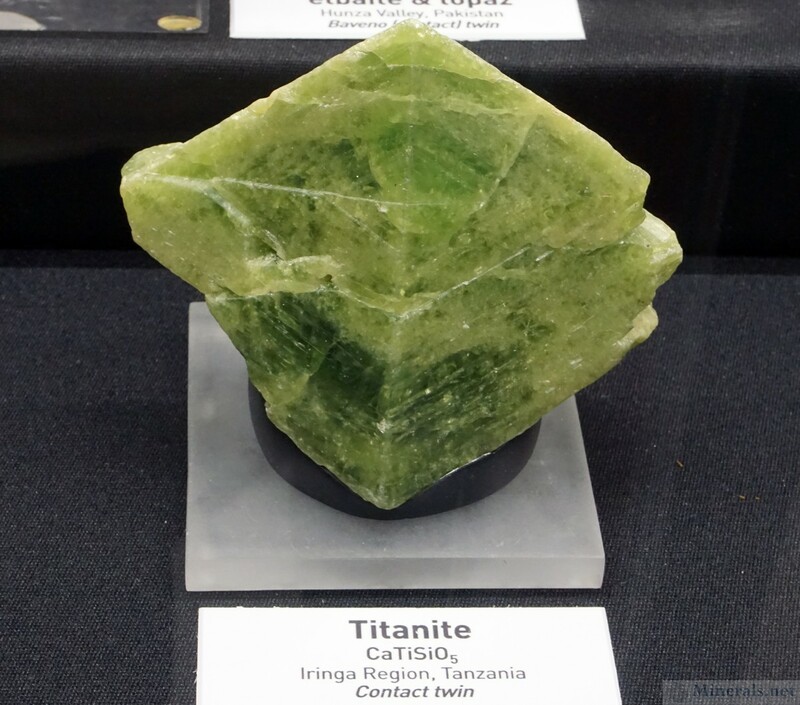 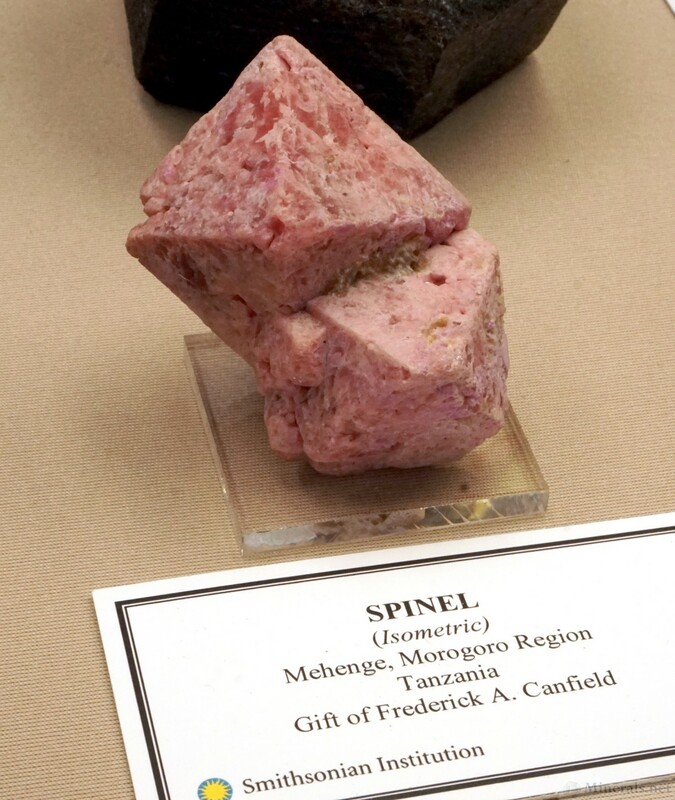 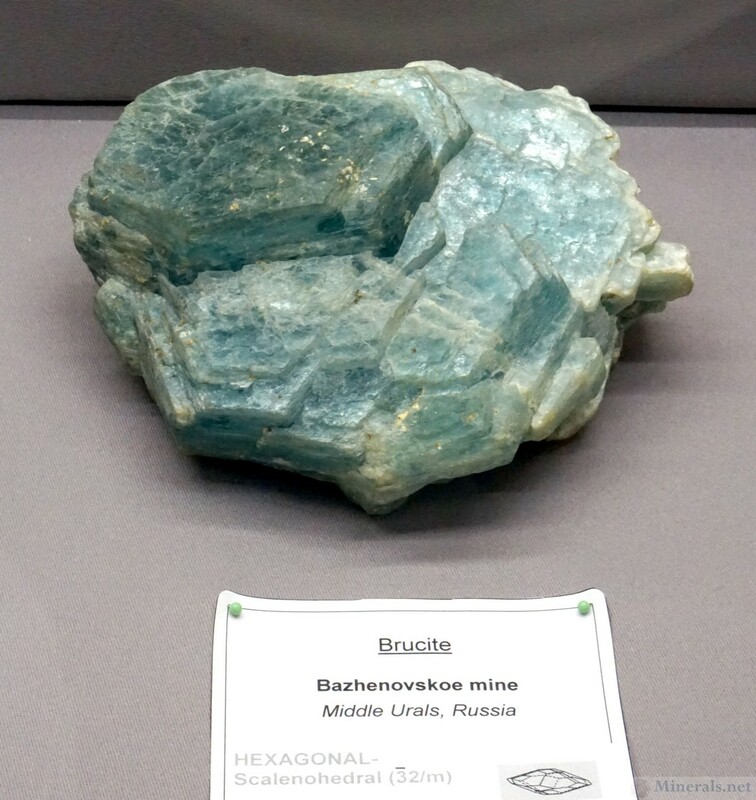 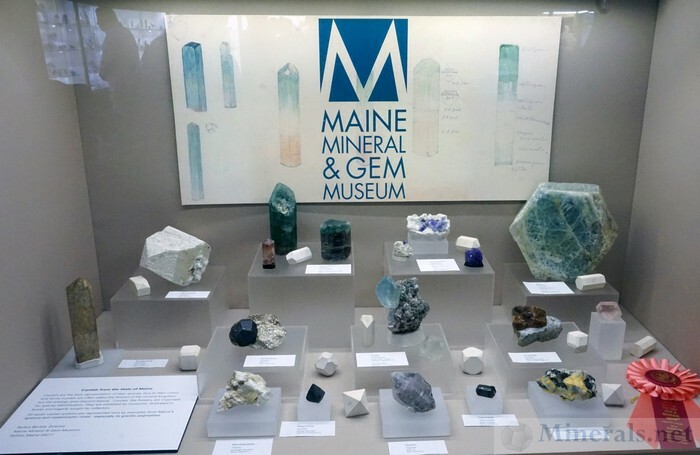 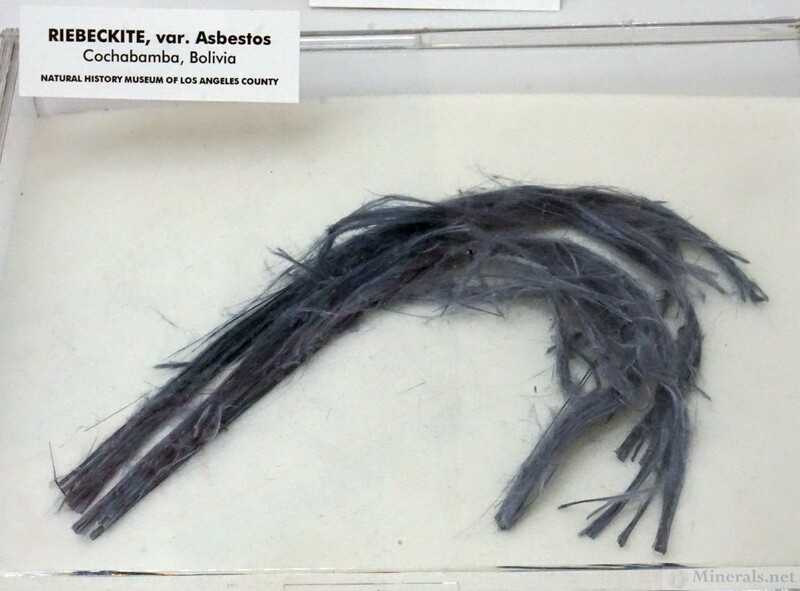 They often select minerals from their collection relating to the show theme, and put together exceptional cases of these mineral in a traveling exhibit. 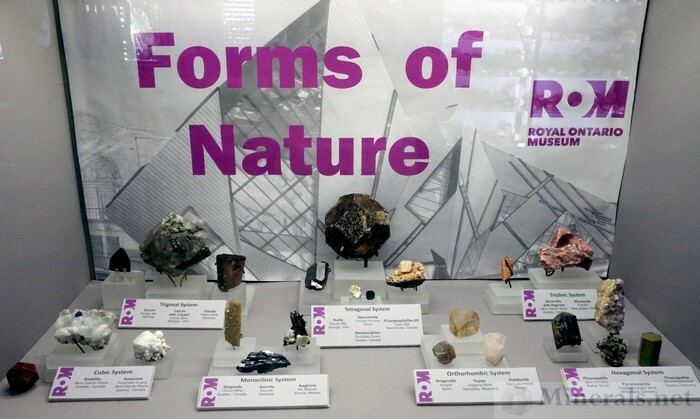 Museums such as the Smithsonian Institution, American Museum of Natural History, and the Royal Ontario Museum are among the list of prestigious museums exhibiting at this show. 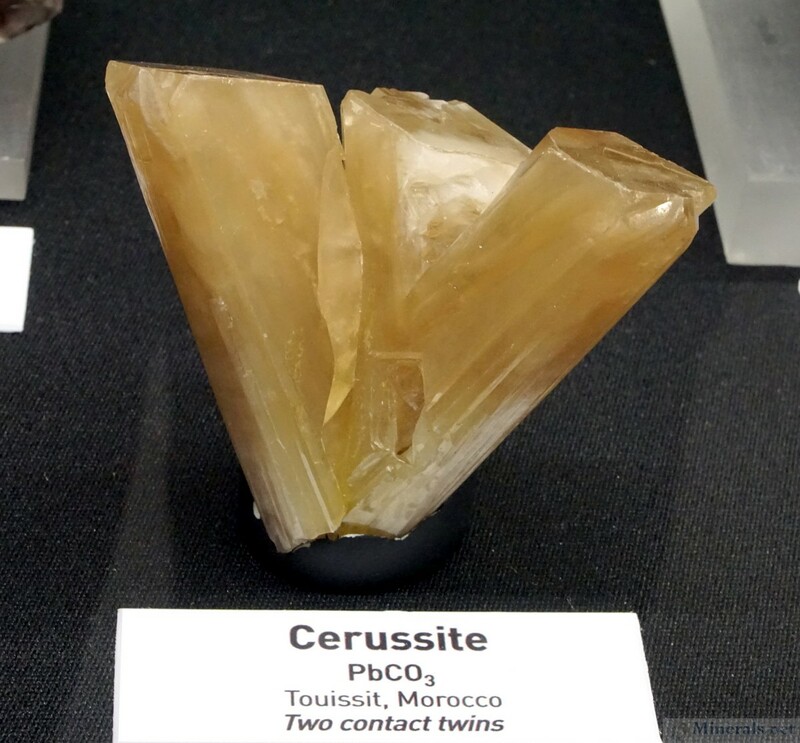 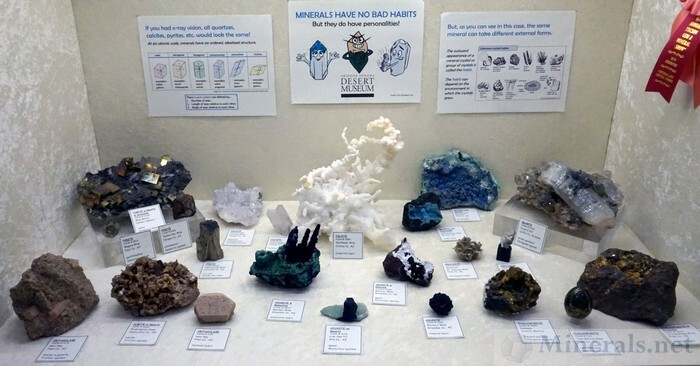 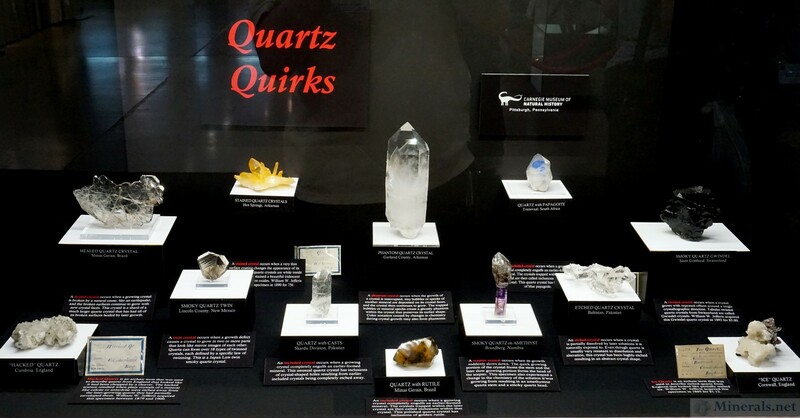 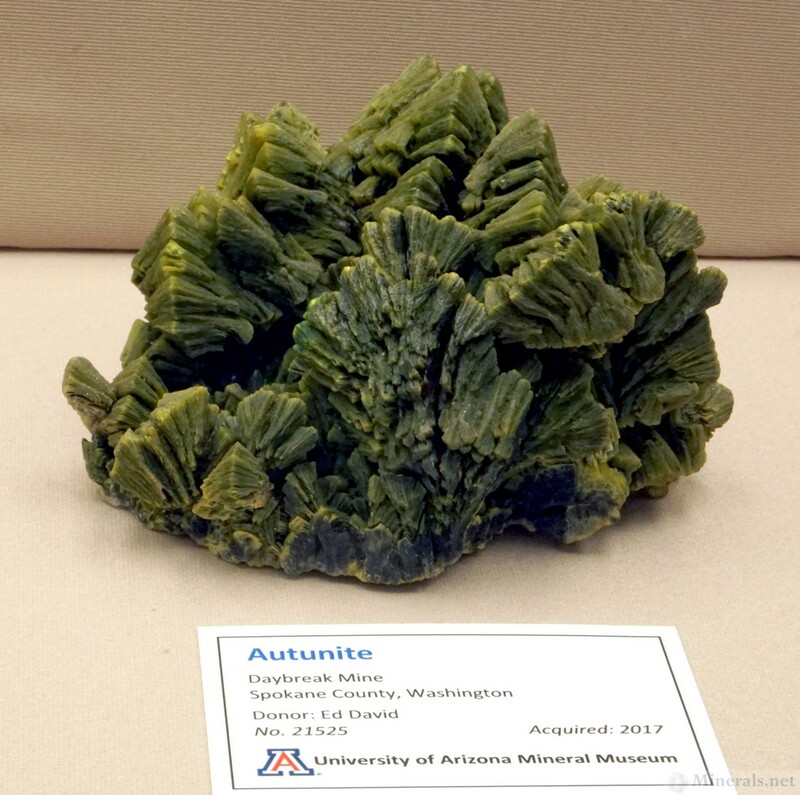 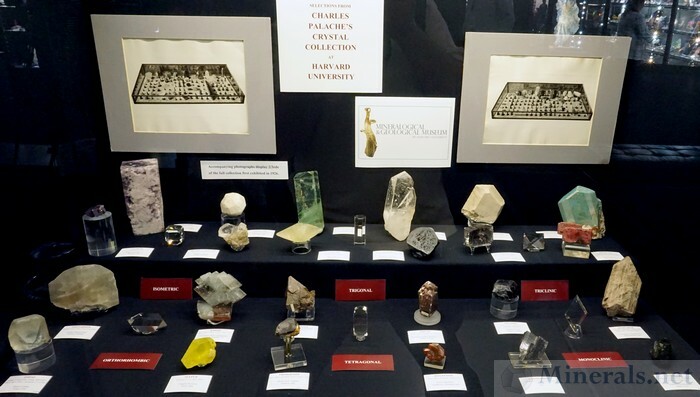 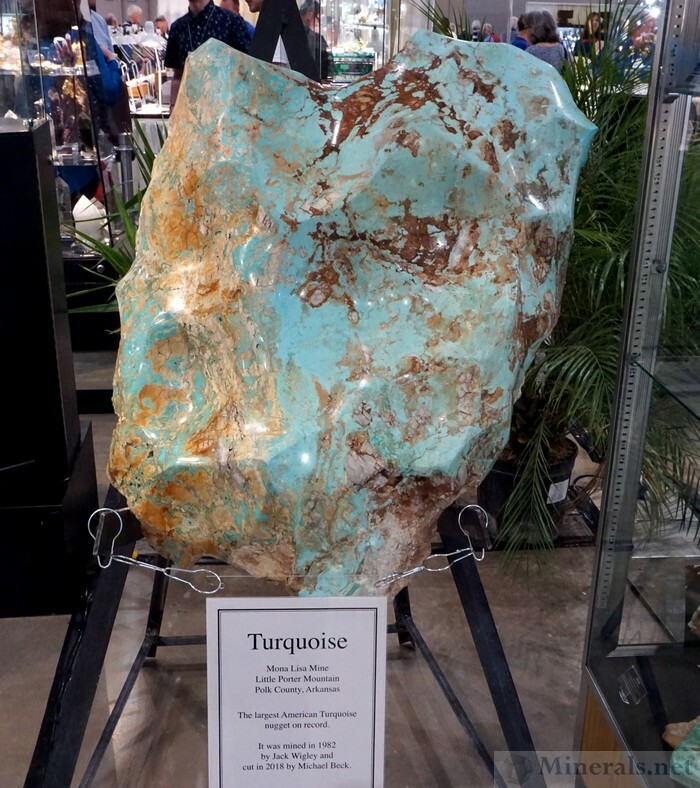 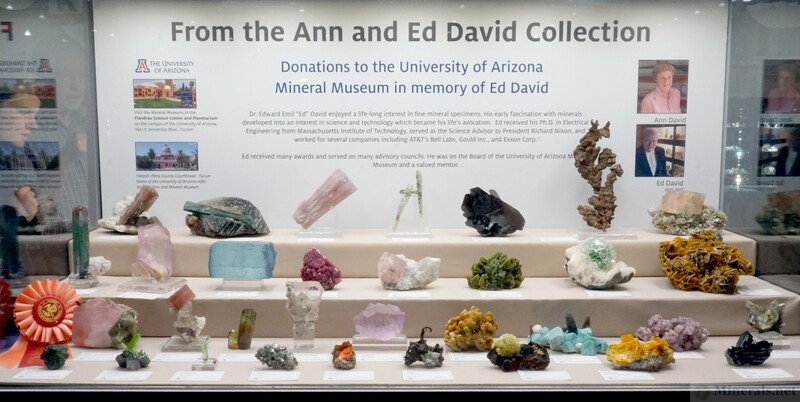 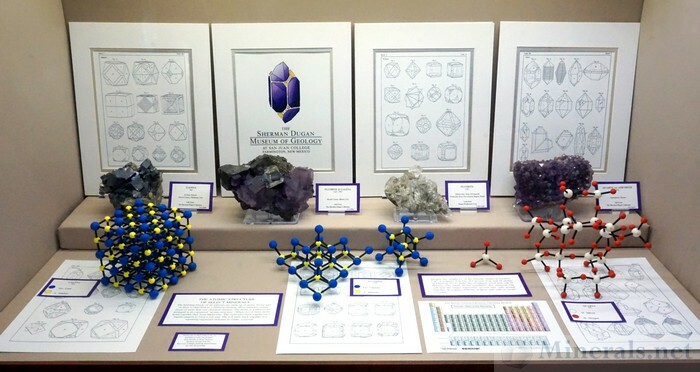 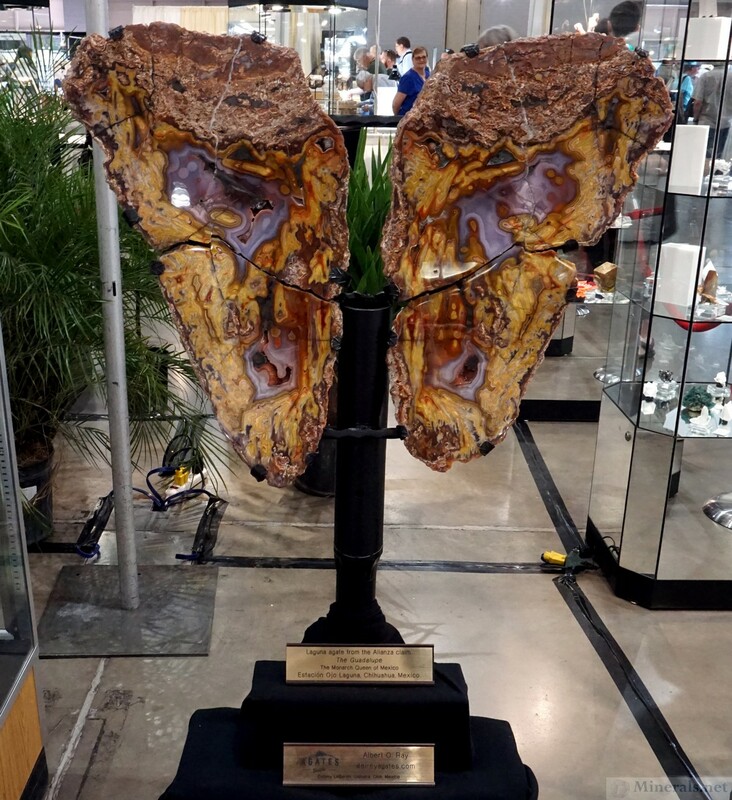 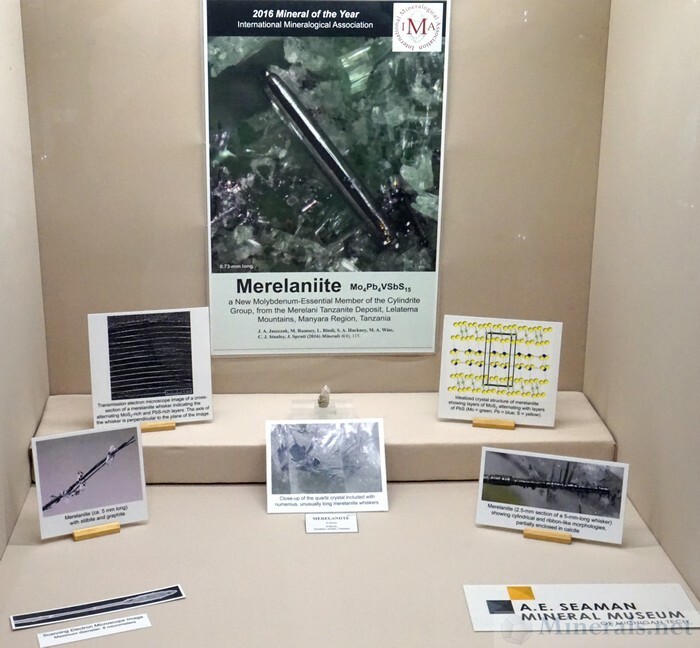 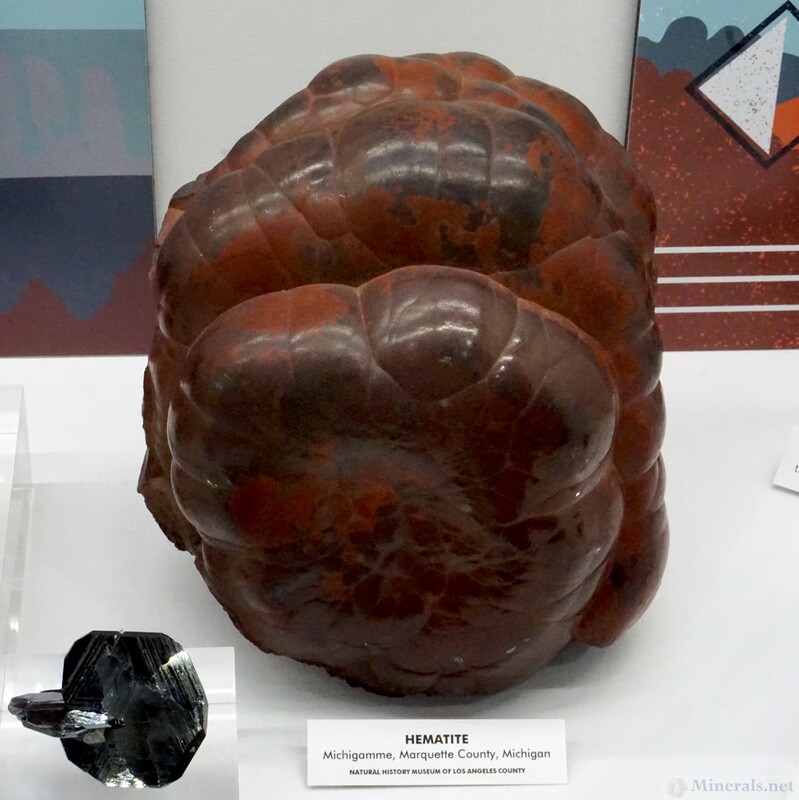 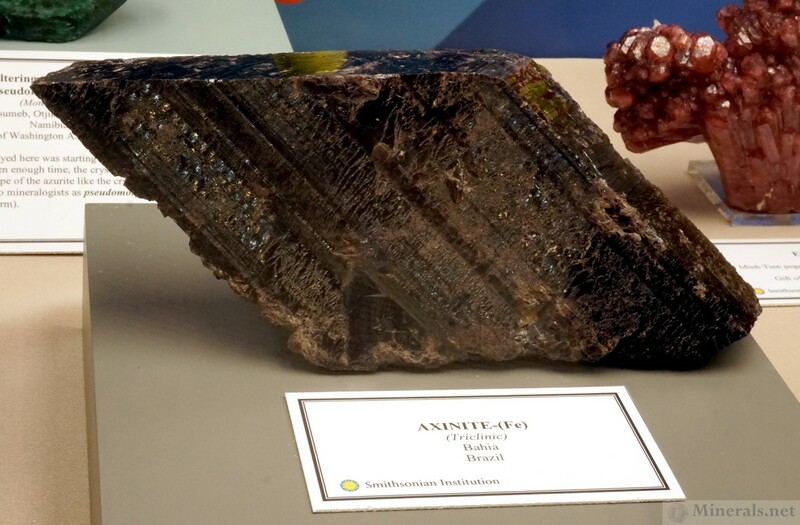 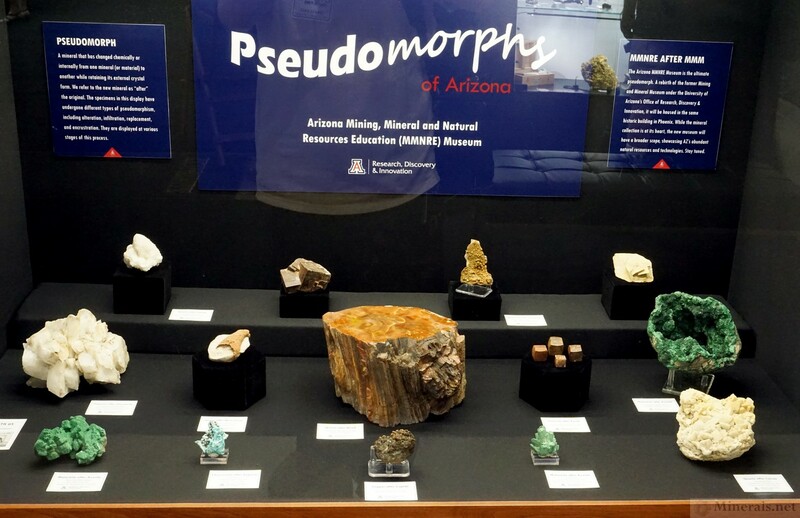 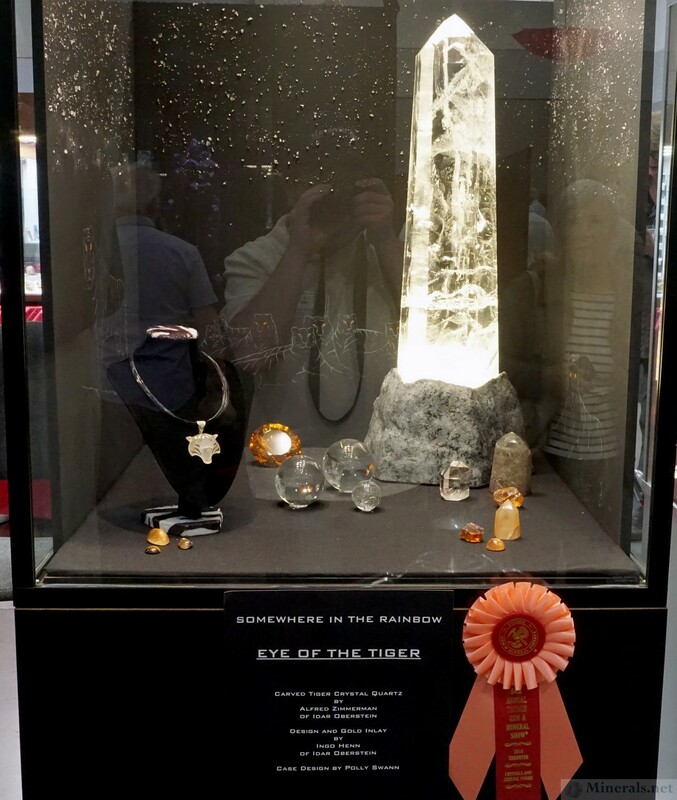 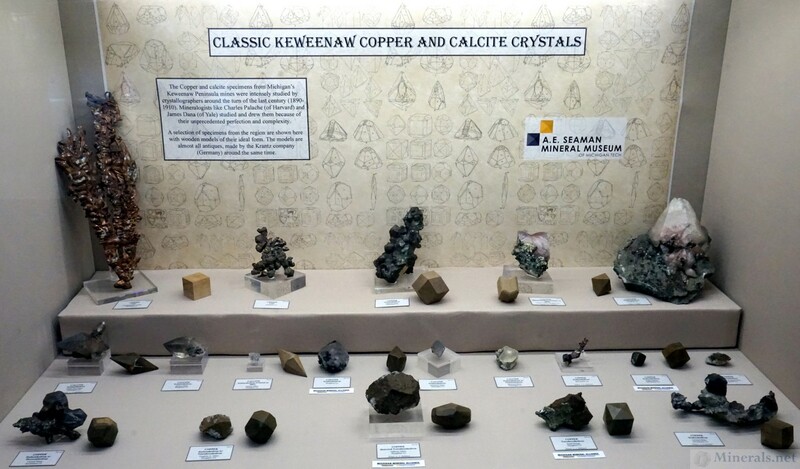 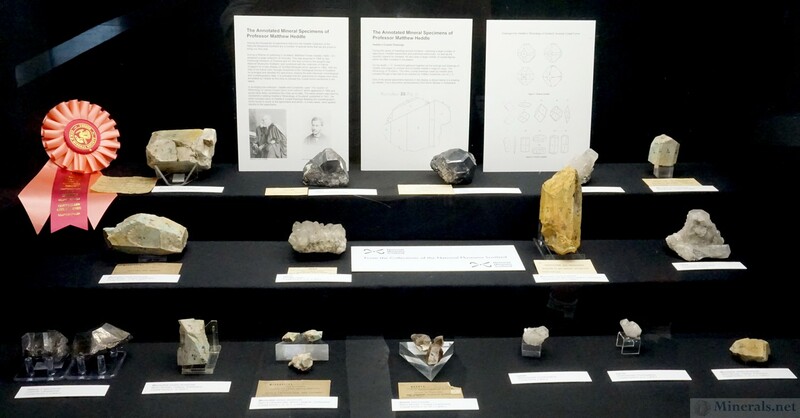 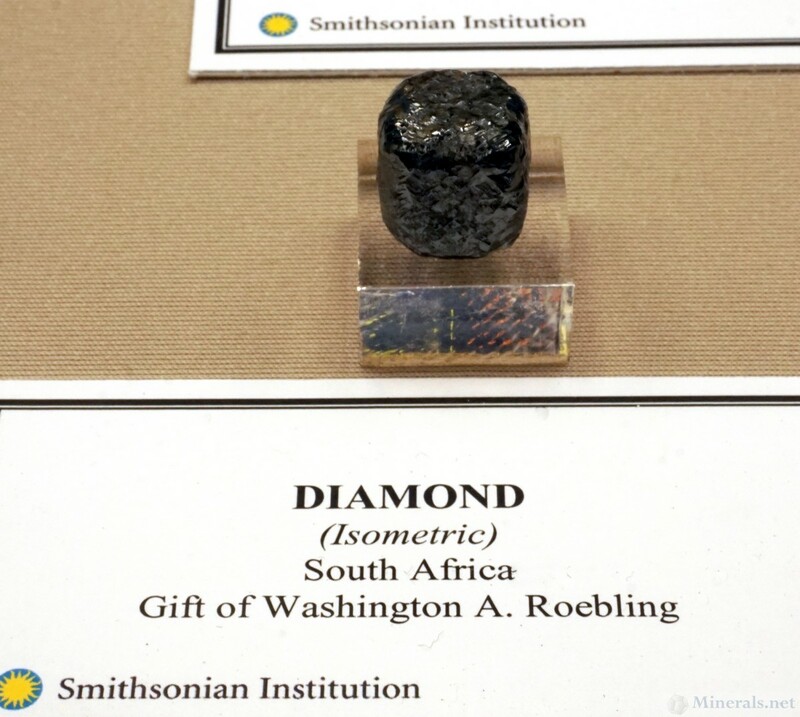 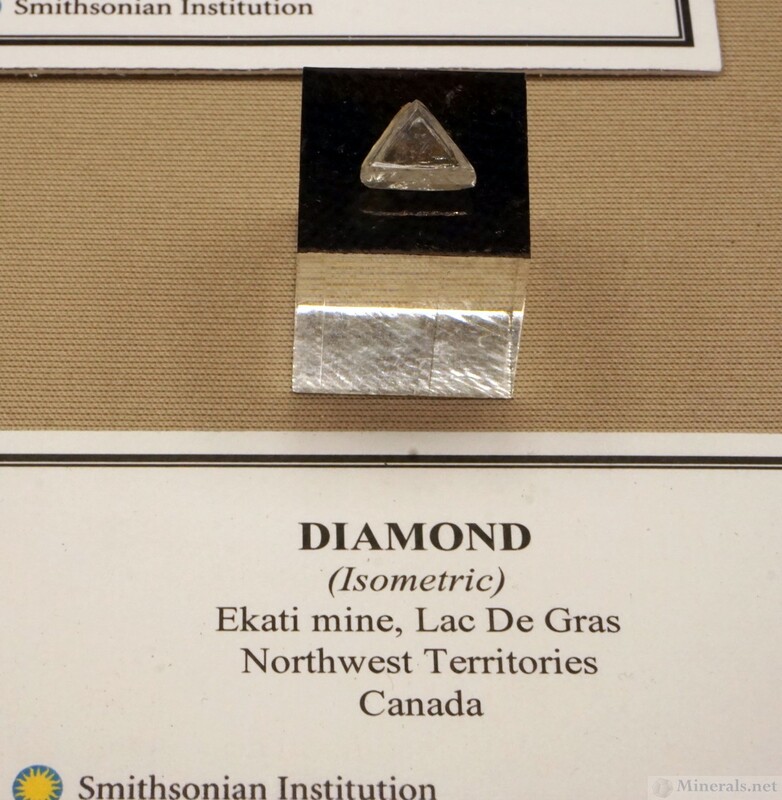 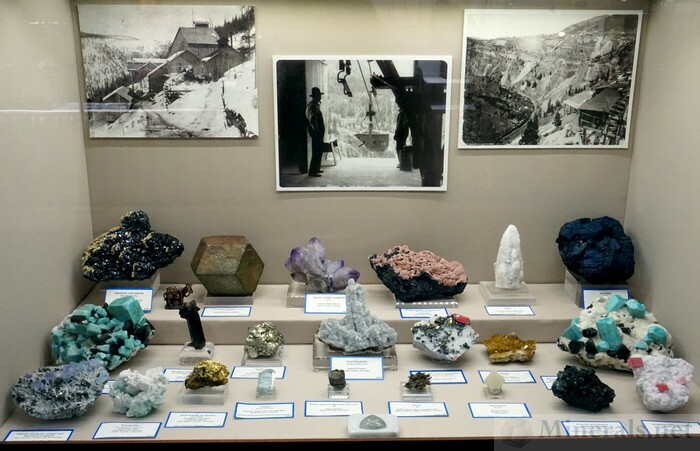 This is the first of two posts on the museum display cases at the 2018 Tucson Gem and Mineral Show®. 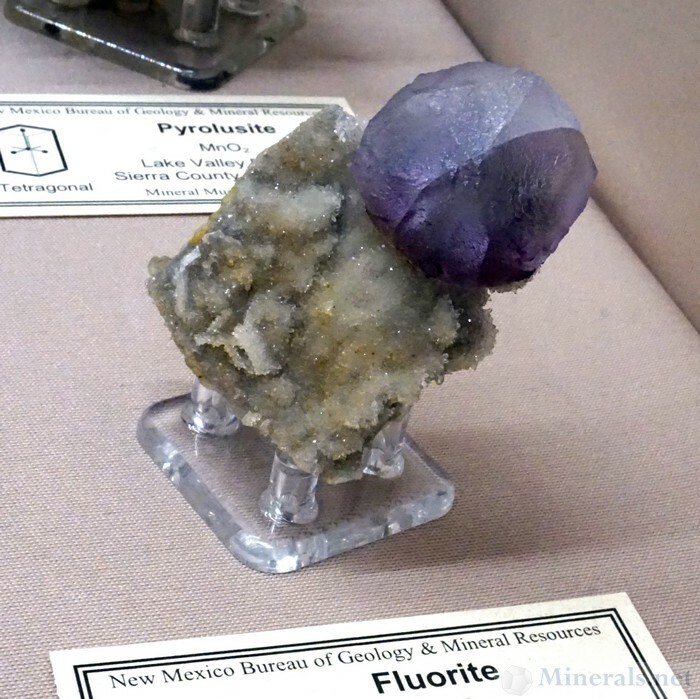 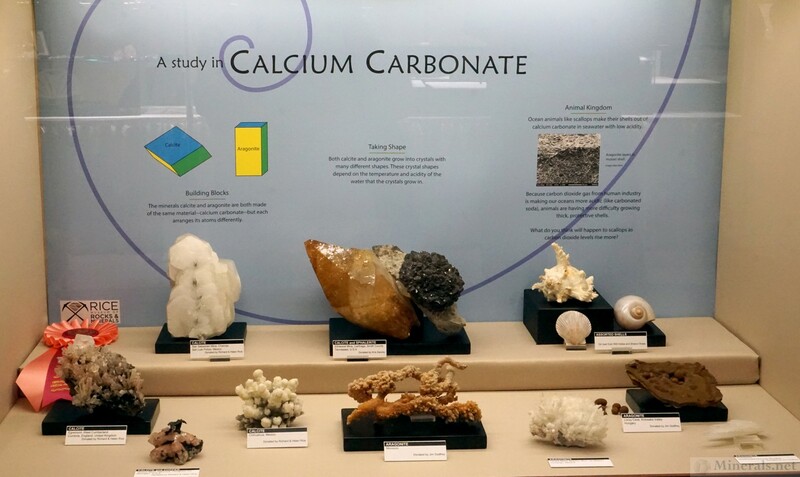 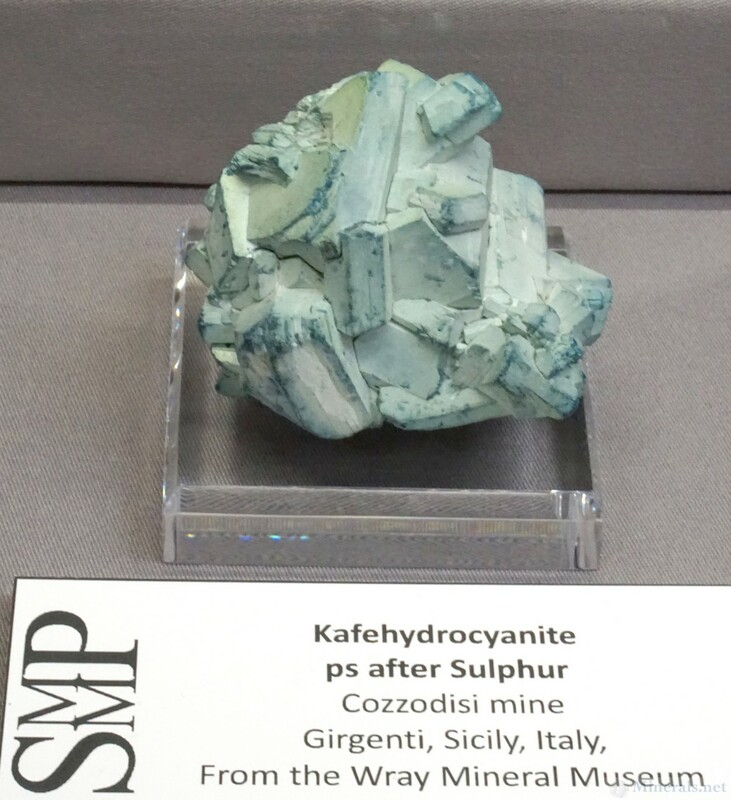 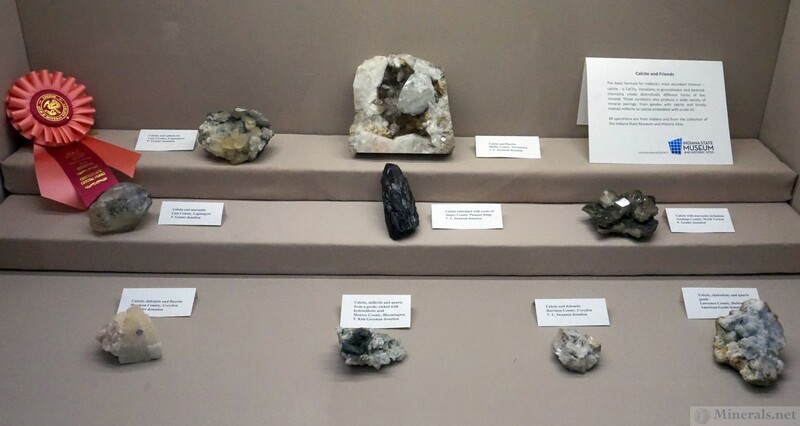 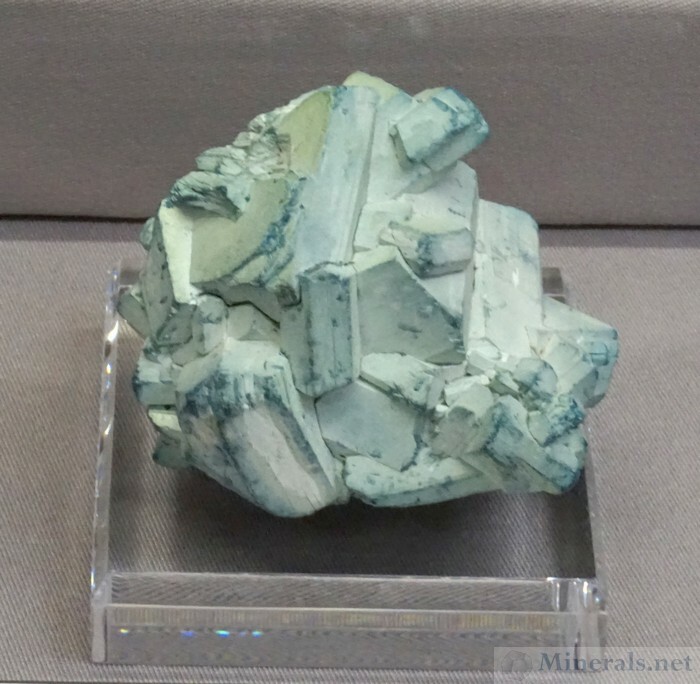 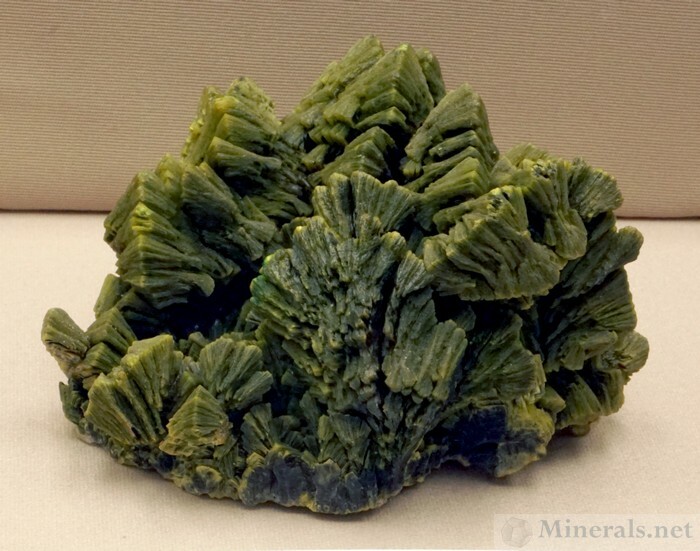 We will also create a separate post of some of the individual minerals in the exhibits in a later posting. 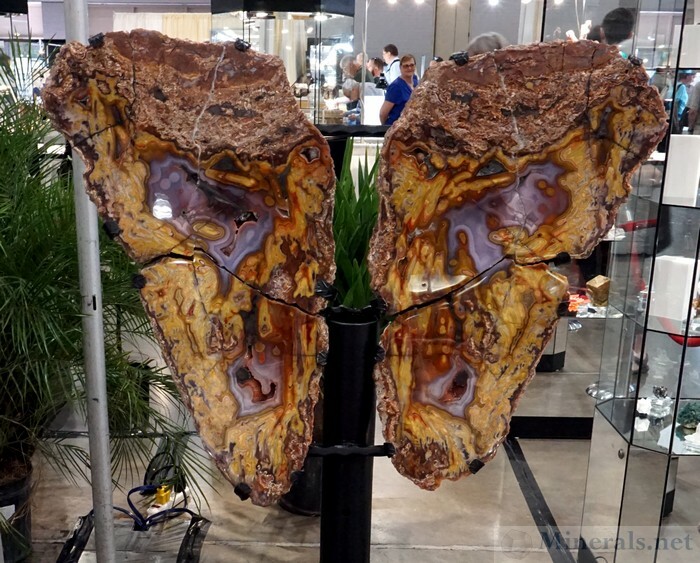 The Tucson Gem and Mineral Show® has some of the most impressive public displays. 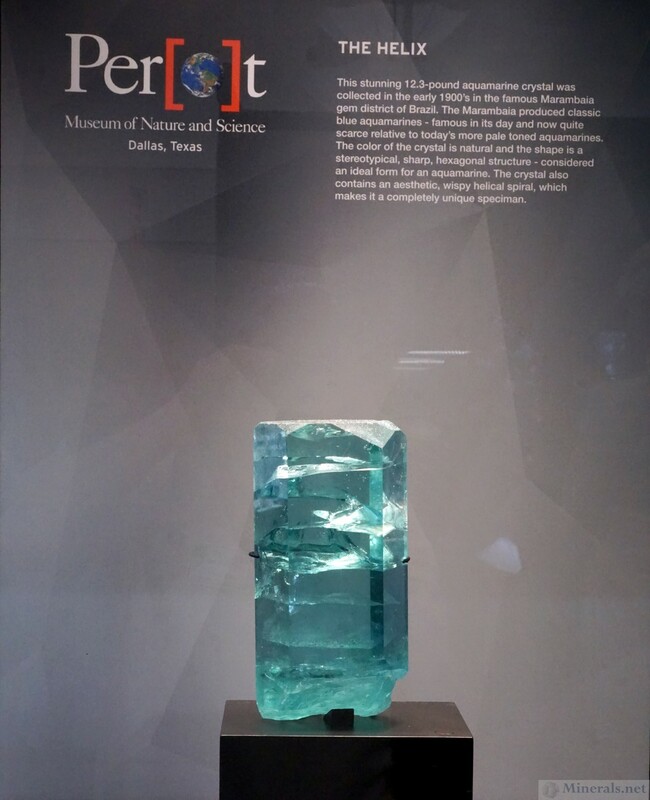 Aside from the displays of the museums and private collectors, there are also several featured exhibits of exceptional individual pieces. 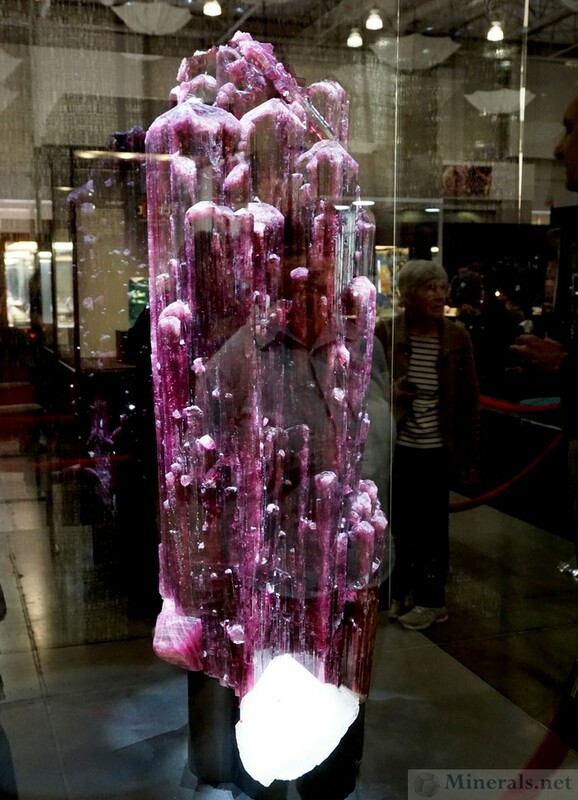 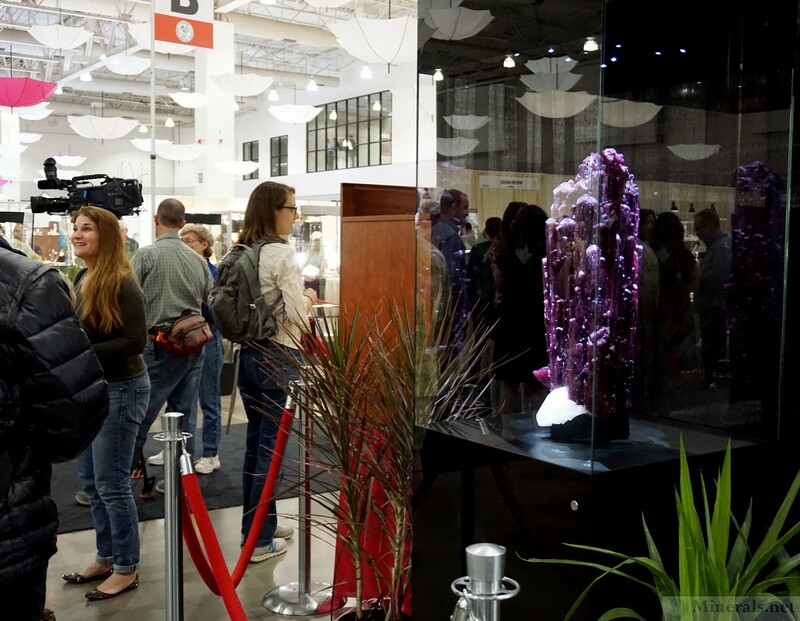 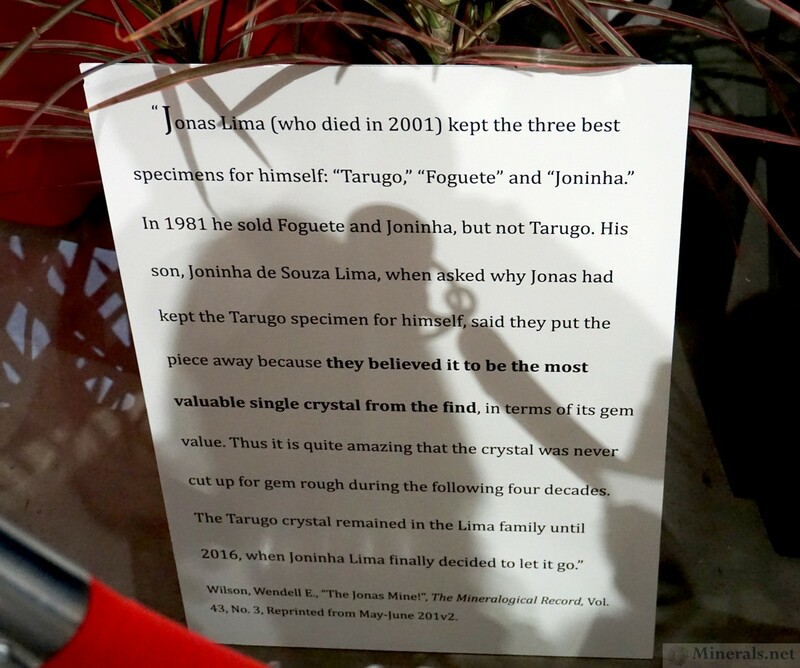 This year's show featured some magnificent items, including a giant red Elbaite Tourmaline from the Jonas Mine in Brazil, which is the largest and most significant specimen from this mine. 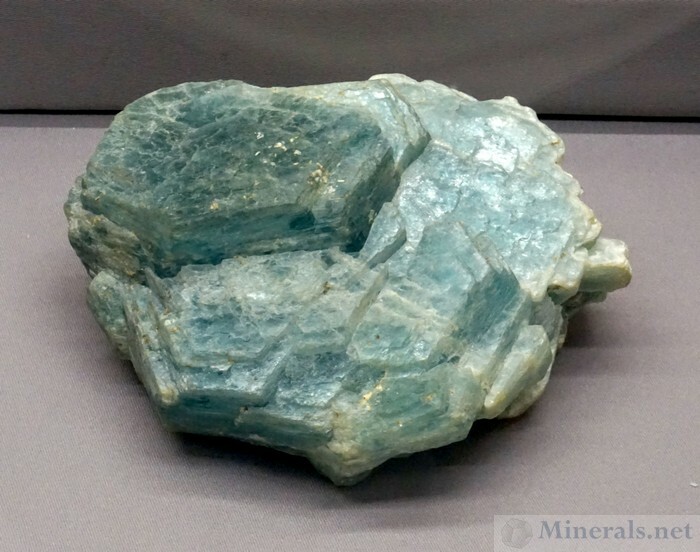 Also featured was an iconic Aquamarine crystal with internal "helix" growths, from the Marambaia Gem District in Brazil. 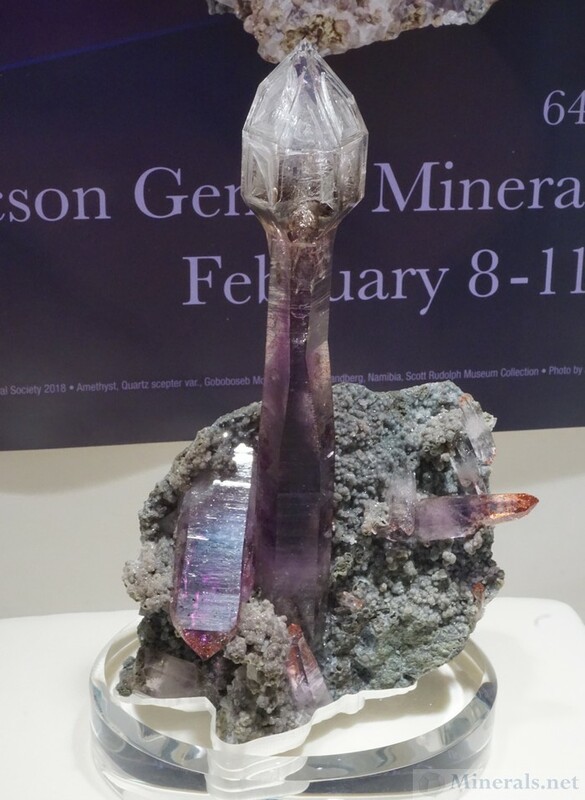 The Tucson Gem and Mineral Show® is the world's most significant mineral event. It is the culmination of several weeks of gem and mineral activities taking place in Tucson, Arizona, every February, transforming this desert city into a bustling oasis of crystals and gems. This show, put together by the Tucson Gem and Mineral Society, is known for its participation of all important mineral people, with a dazzling array of dealers, buyers, and exhibitors. 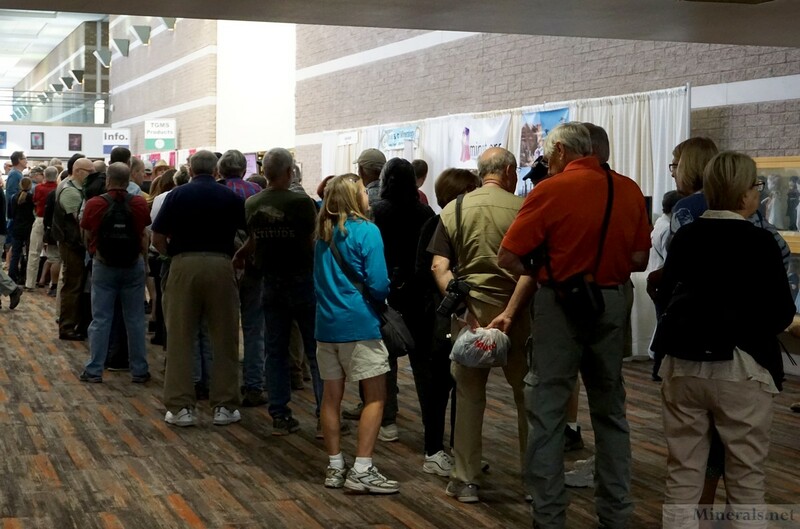 This year's show started on Thursday, February 8, through Sunday February 11. The theme was "Crystals and Crystal Forms," with a special emphasis on crystal habits and formation. 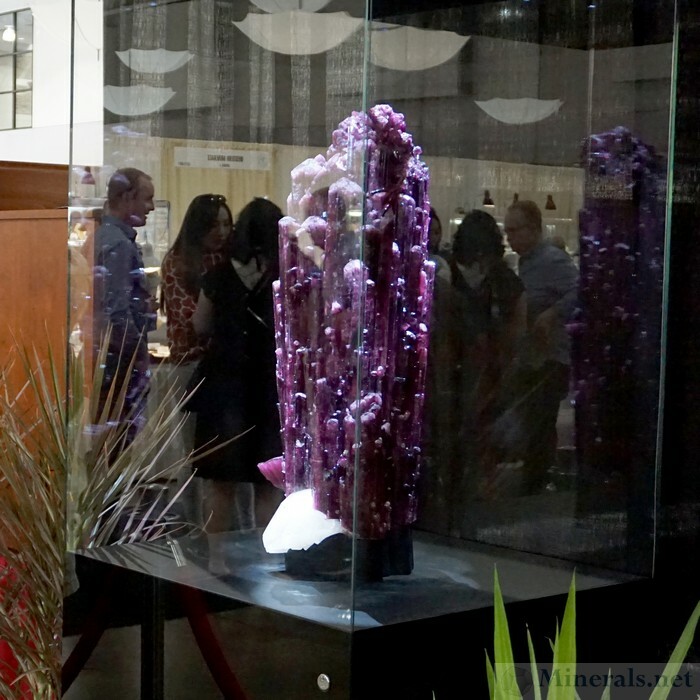 As usual, the displays were outstanding, with the finest minerals in professional and eye-catching display arrangements. 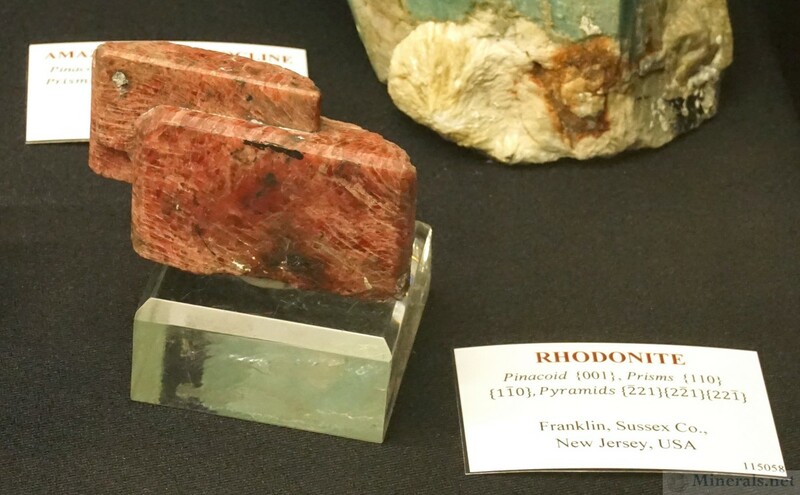 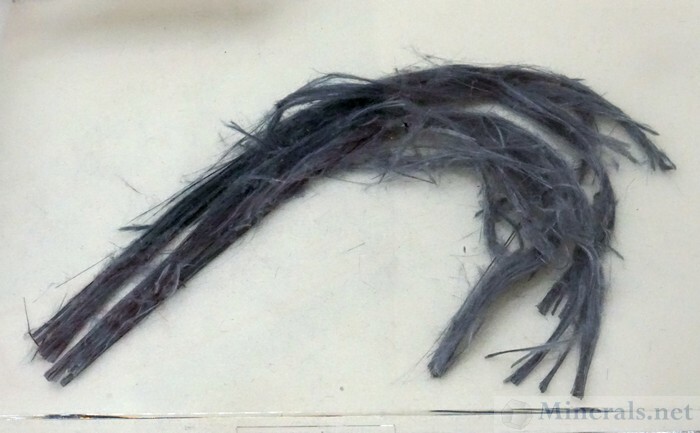 Aside from having the most significant public exhibits of any show, many dealers save their most important items for this show and wait to introduce new finds at this show. 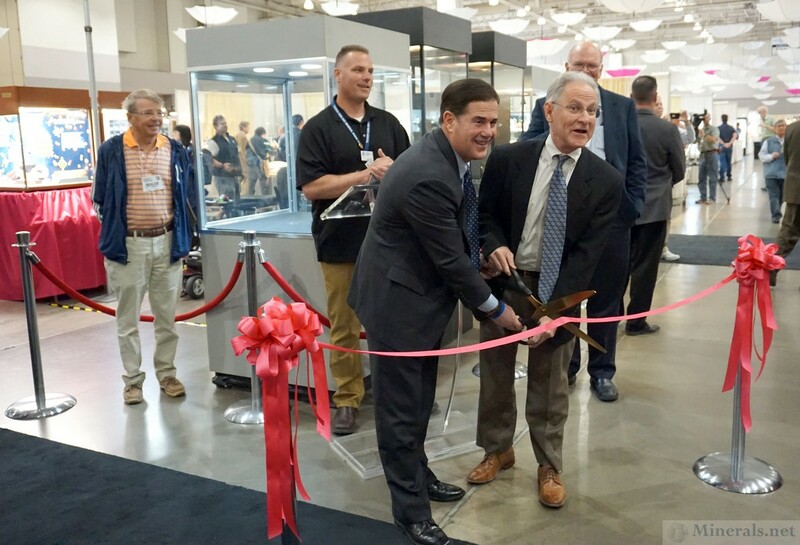 The importance of this can be stressed by the presence of almost all VIP's in the hobby, as well as local politicians and native Tucsonians. Even the governor of Arizona, Doug Ducey, was present for the opening ceremonies and given a special tour. 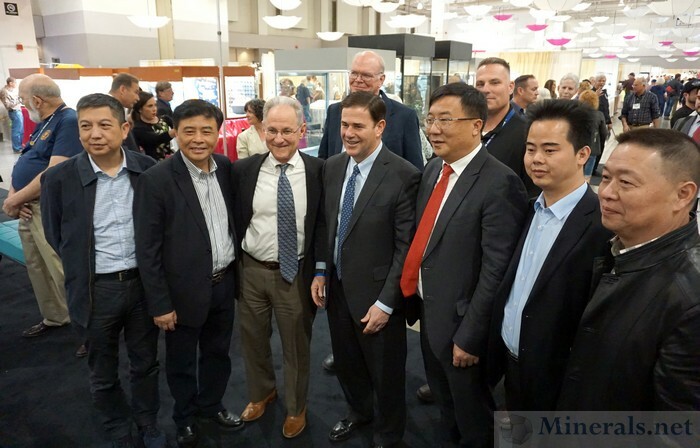 He was accompanied by Tucson mayor Jonathan Rothschild. 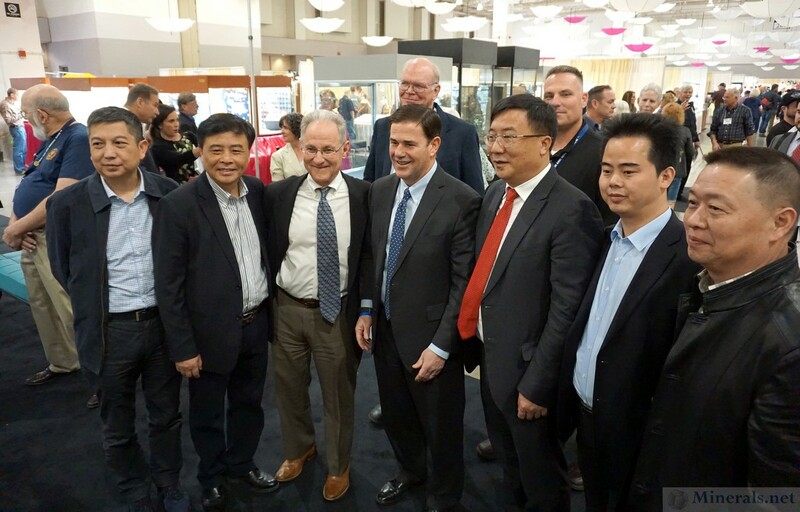 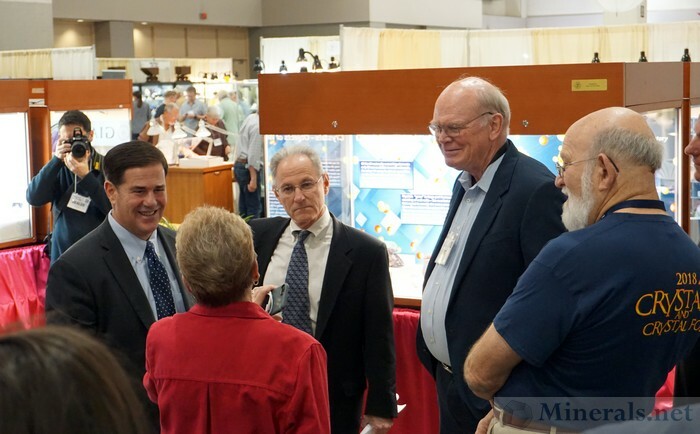 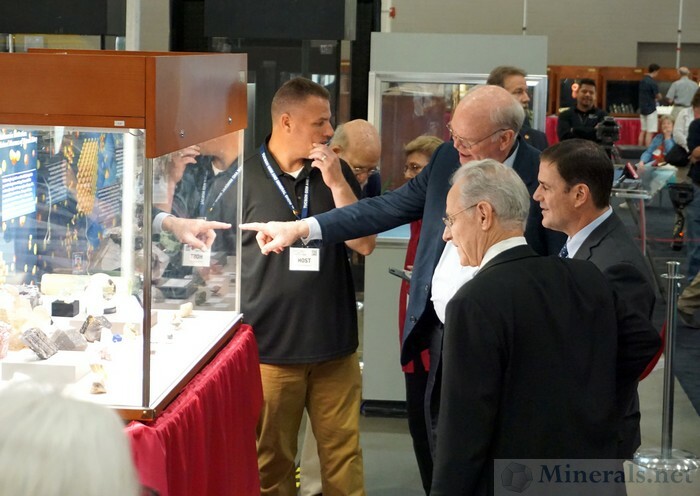 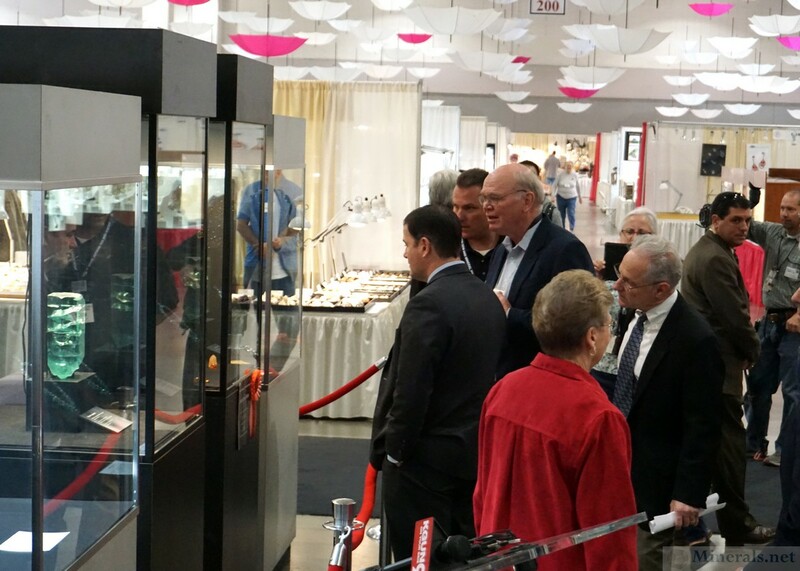 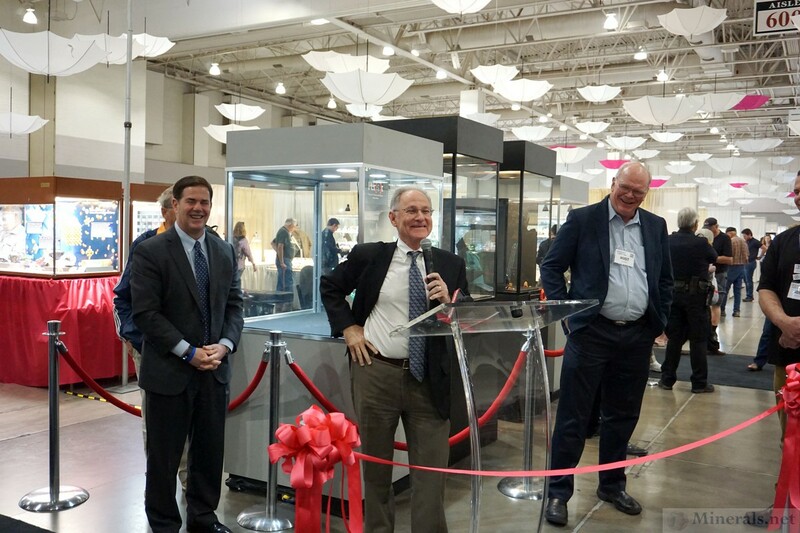 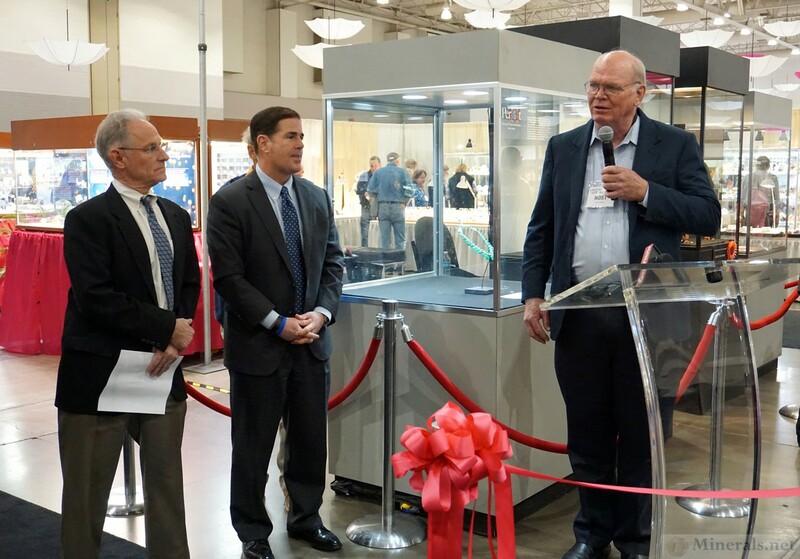 This post, the first of the The Tucson Gem and Mineral Show®, covers the opening ceremony of the show, including the governor and mayor's visit.